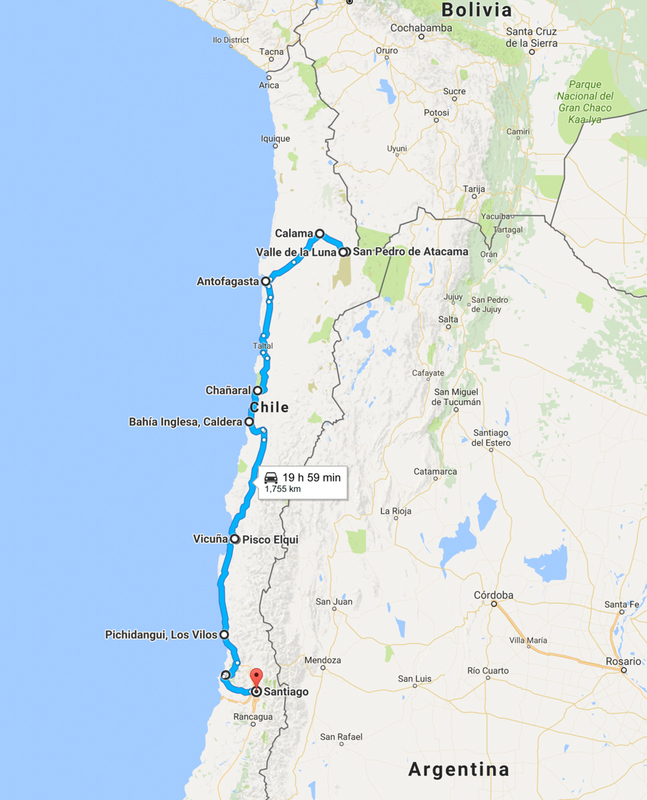 Northern Chile: Go Big or Go Home - Live. Travel. Play. 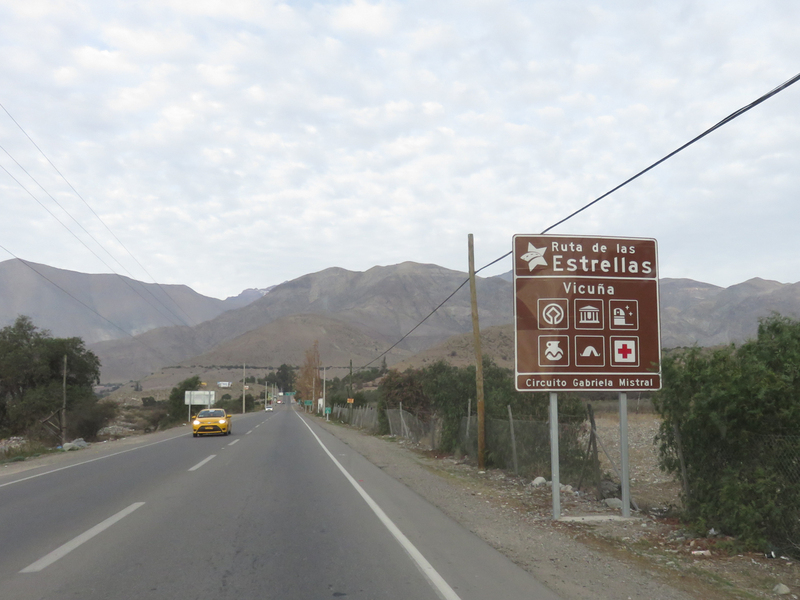 Entering Chile was like entering the first world again. 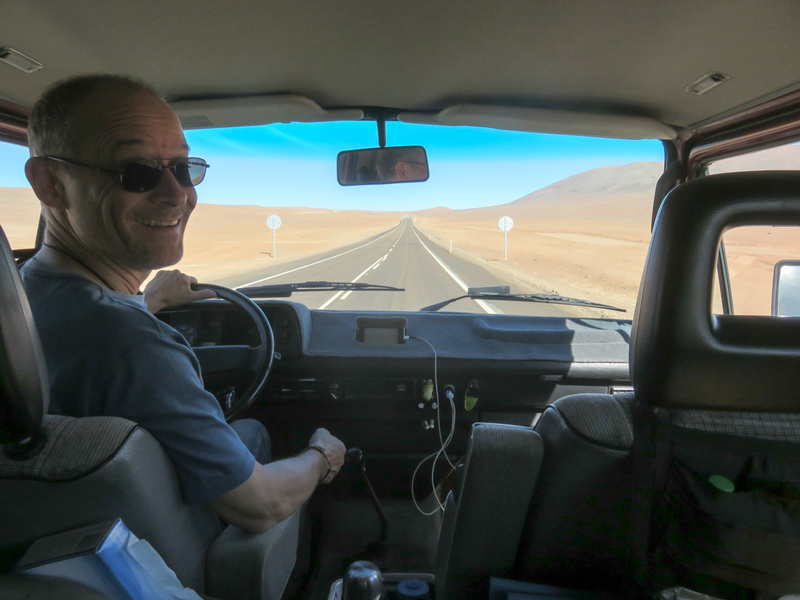 Gregor and I had just finished driving Bolivia’s Lagunas Route, where the roads were pure dirt and we had little contact with civilization for four days. 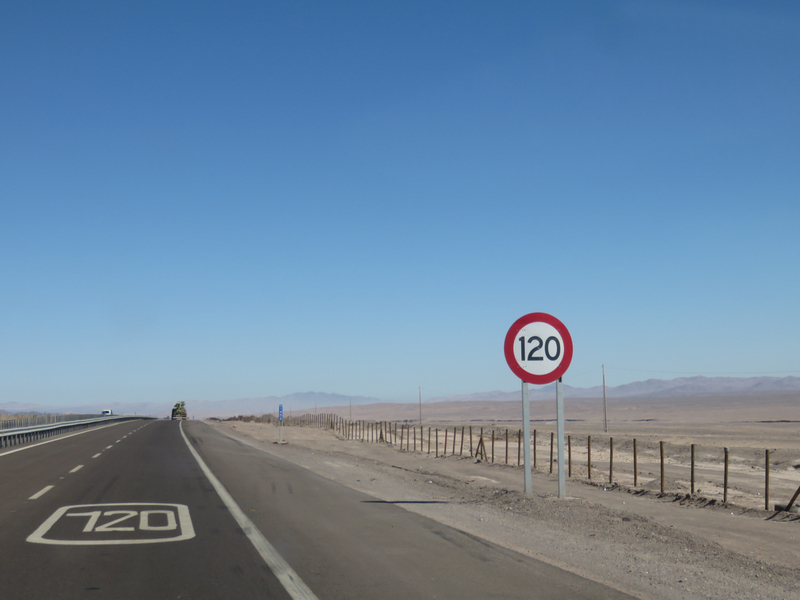 Once we crossed into Chile, we found ourselves on a pristine highway with speed limit signs, tidy shoulders, SOS stations, and runaway lanes – all indicators of a safety-conscious society. 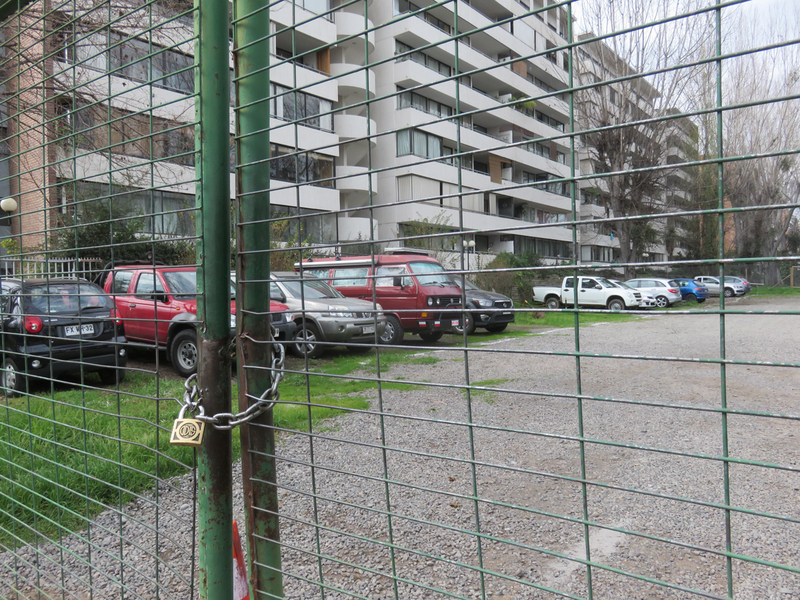 At the Chilean Customs office, the uniformed officials took away our Bolivian fruits and vegetables – the protocol of a highly regulated agriculture industry. 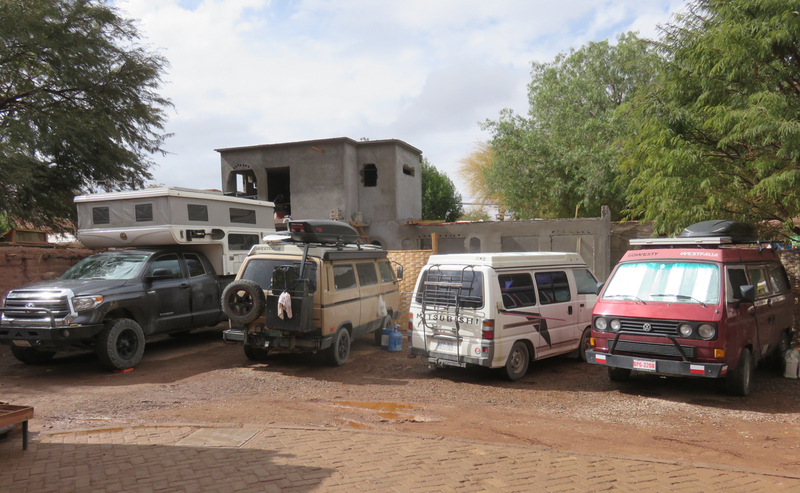 And when we were charged $30 CAD to “camp” in a hostel parking lot, well, there was no denying that we had entered a country of means. We spent our first week in northern Chile’s top destination for adventure tourism: San Pedro de Atacama. 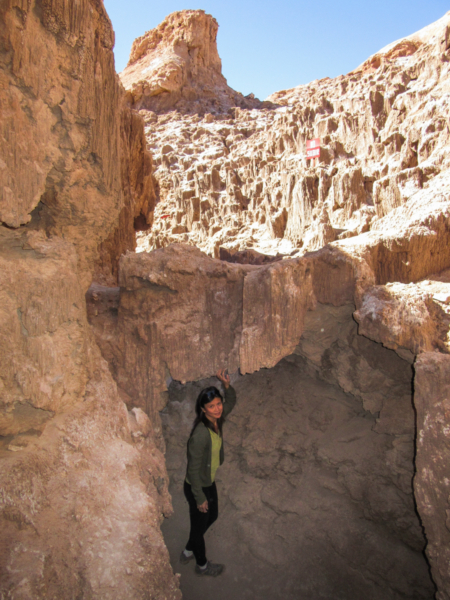 Local and international vacationers flock to this desert town to climb the nearby mountains, hike and horse-ride in the valleys, visit geysers and archeological sites, and star-gaze in the region’s observatories. You can even sand board and drive quads on the dunes near town if you like. 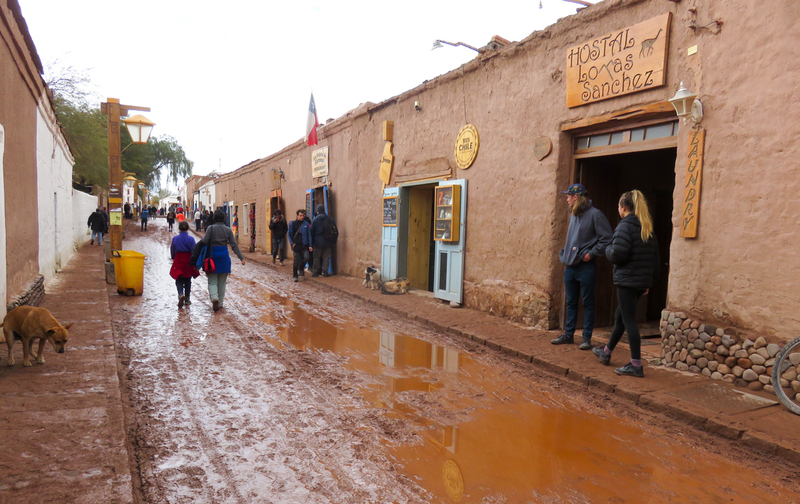 The town itself has charming adobe buildings and pedestrian ways lined with boutiques, restaurants, and hostels. Like most tourist towns, the population is transient and the prices are elevated. After living pretty cheaply in Latin America for so long, we were shocked that the prices for groceries, accommodation, and restaurant meals were similar to the prices we would pay in Canada (sometimes even more!). The only thing that was significantly cheaper was wine (it was at least 50% cheaper than in Canada). And it was damn good wine. Empanadas were good, too. This one was freakishly large. 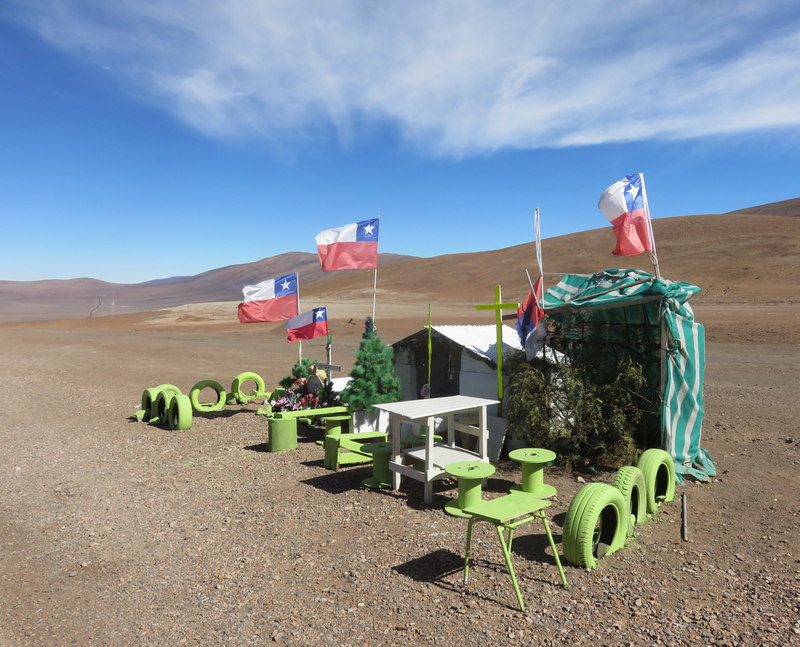 The other thing that was markedly different about Chile was the way the locals spoke. They spoke Spanish but I couldn’t understand what anyone was saying. They spoke really fast, and it sounded like they slurred a lot of words together. I later found out that many South Americans don’t understand Chileans because they use a lot of slang and have a weird accent. This isn’t surprising, seeing that Chile is separated from the rest of the continent by the Andes mountains. 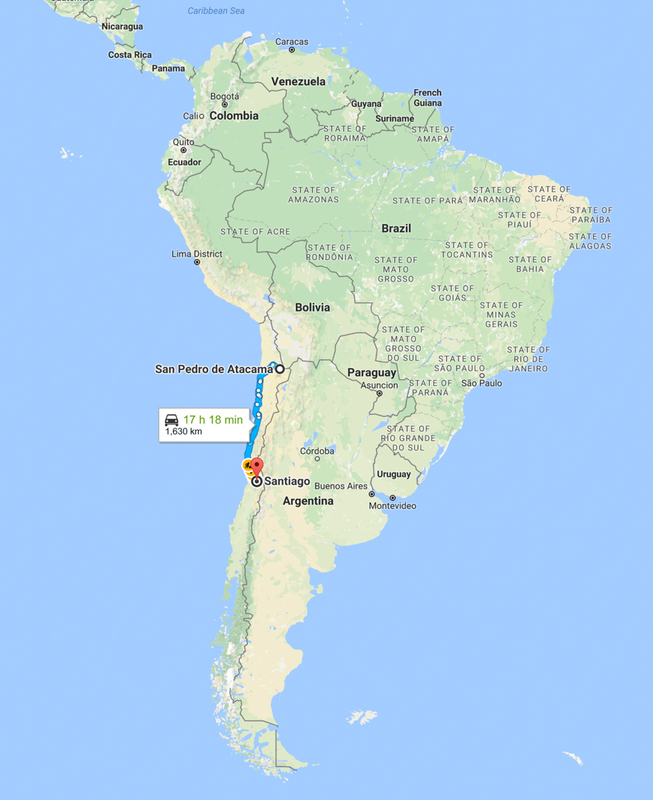 Chile is a remarkably long and skinny country. It’s over 4270 km long and averages only 177 km from east to west. 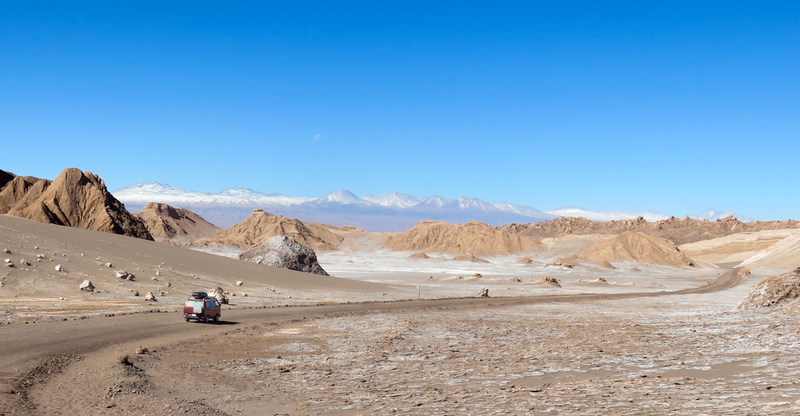 During our first month in Chile, we drove southward through the Atacama Desert towards the capital of Santiago. 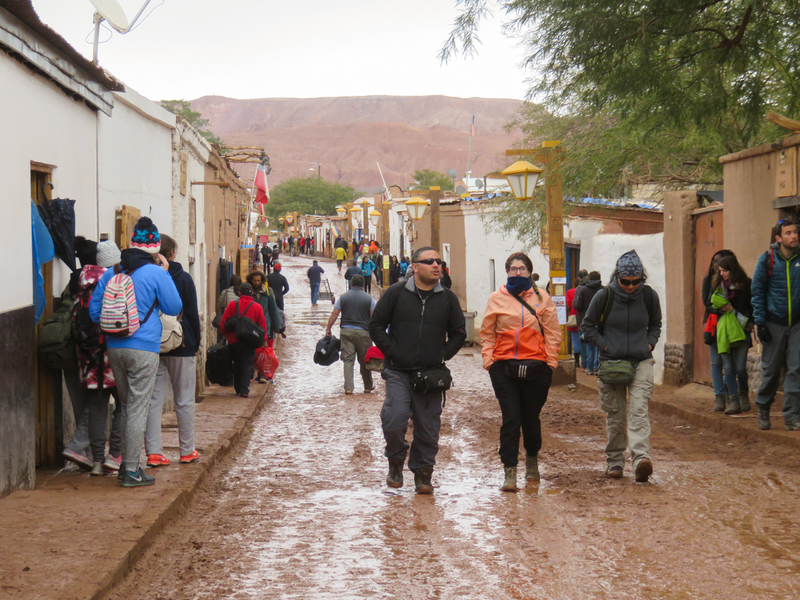 Our first stop was Valle de la Luna, a park in the Atacama Desert that preserves interesting landscapes made up of dunes, sand ridges, salt flats, and caves. 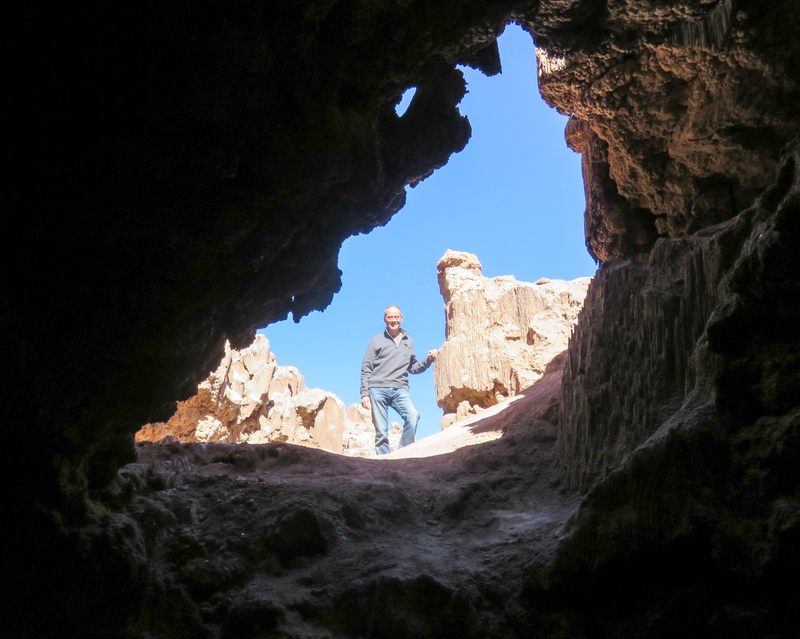 Driving westward to the coast was an eye-opening experience. 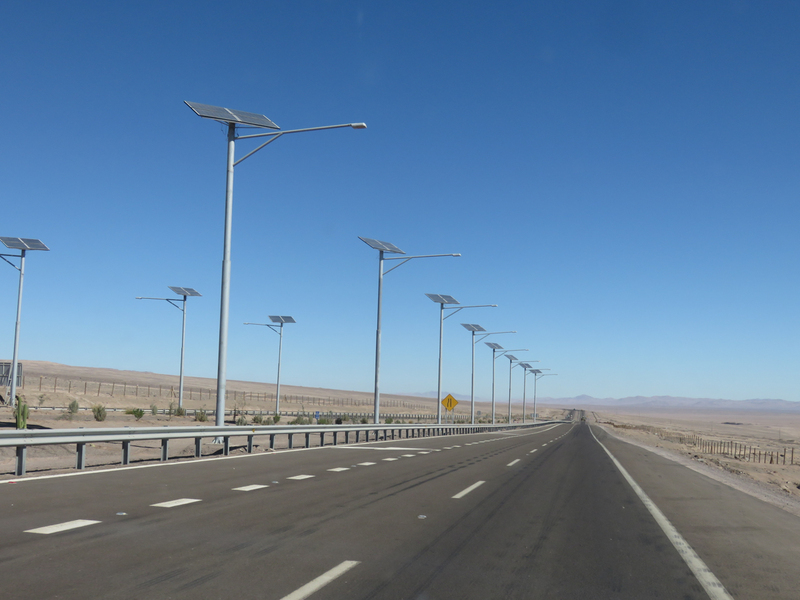 Unlike Peru’s Coastal Desert, where highways were strewn with garbage and had speed limits of 80 km/h, Chile’s Atacama Desert had clean highways and super fast speed limits of 120 km/h. 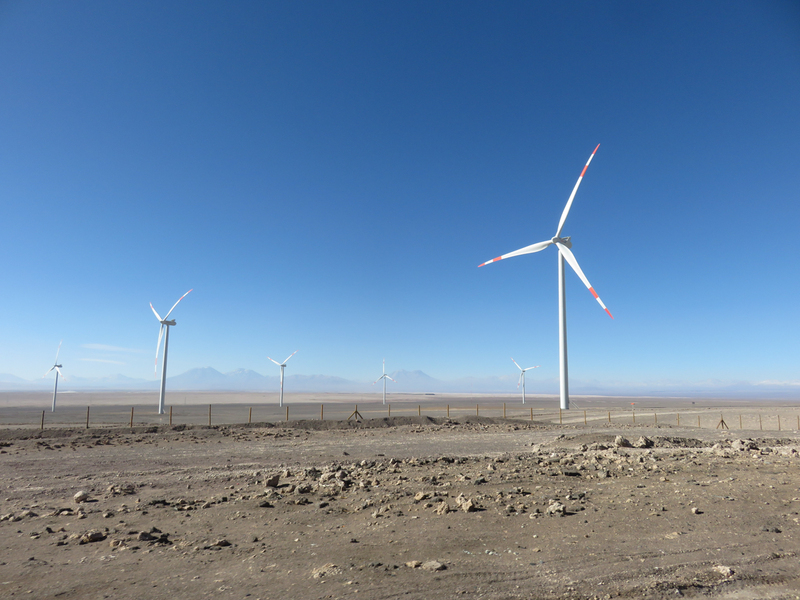 We also saw big wind farms and solar-powered systems – things we hadn’t seen in a long time. 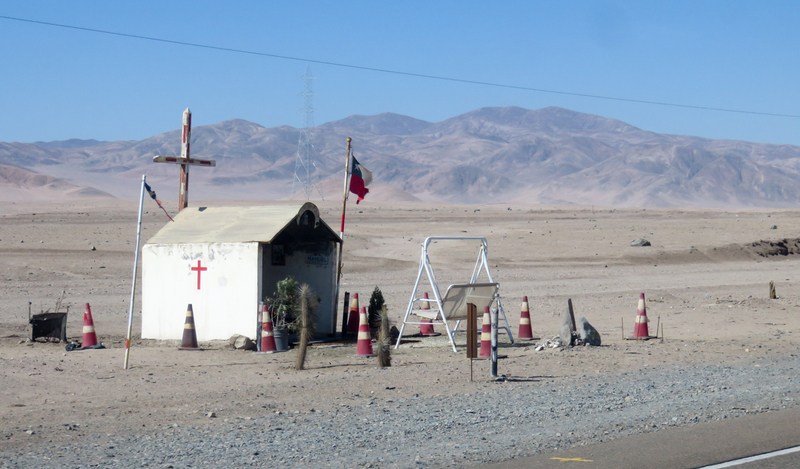 As in other Latin American countries, there were lots of memorials along the highway that marked the sites of fatal traffic accidents. 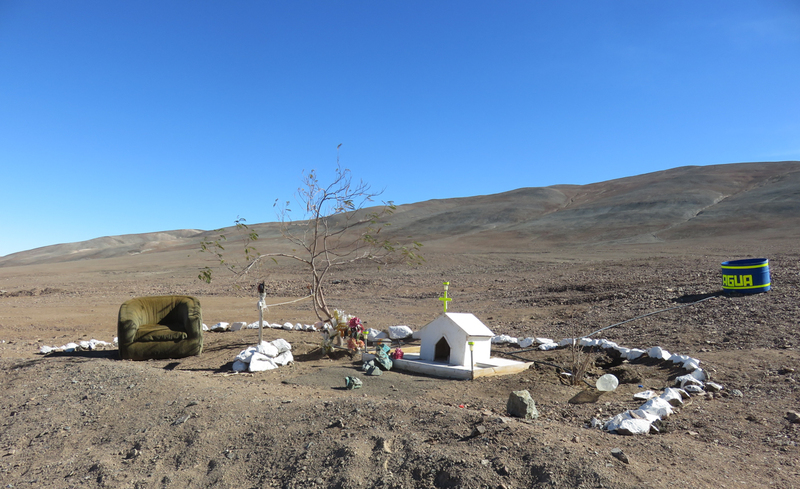 The difference between those memorials and the ones we saw in Chile’s desert was that the Chilean memorials were elaborate and huge. 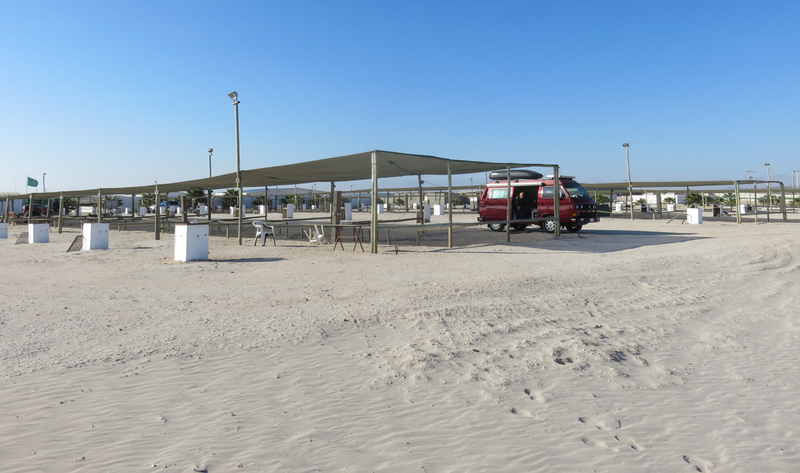 I mean, these memorials were picnic sites with colour-coordinated themes, lounge furniture, and live trees – right in the middle of the sand. There were typically multiple flags, crosses, and ornaments adorning the site, all intended to draw maximum attention. They certainly caught ours. The “go big or go home” theme extended to the shopping culture. 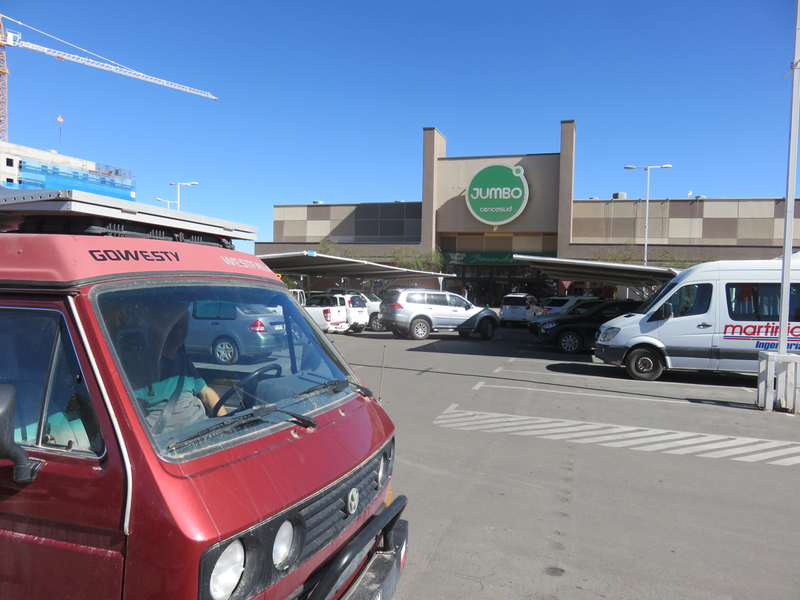 The first major grocery store we visited in Chile was called Jumbo (pronounced “yoom-boh”) and it was like Superstore back in Canada, except it was much bigger and way nicer. There were European-style meats and cheeses in tastefully organized displays. There were all sorts of products that we hadn’t seen in months: Nutella, peanut butter, Toblerone, muesli, rice cakes, and dijon mustard. These days, if we see a grocery store that sells real dijon mustard, we consider it to be a “fancy” grocery store. Jumbo had many different brands of dijon mustard, which qualified it as a “big and fancy” grocery store. It had big and fancy prices to match. 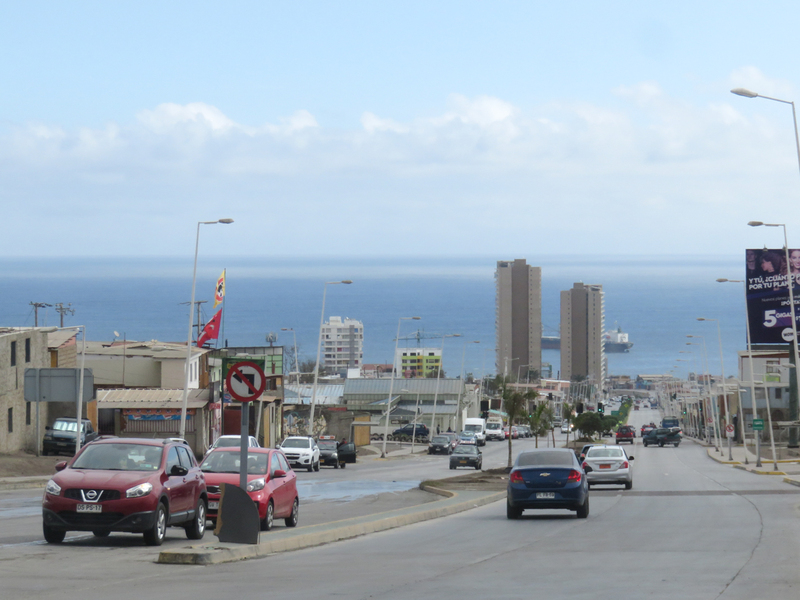 Our next stop was Antofagasta, a sprawling port city that Lonely Planet describes as a “rough-and-ready jumble of one-way streets, modern mall culture, and work-wearied urbanites”. 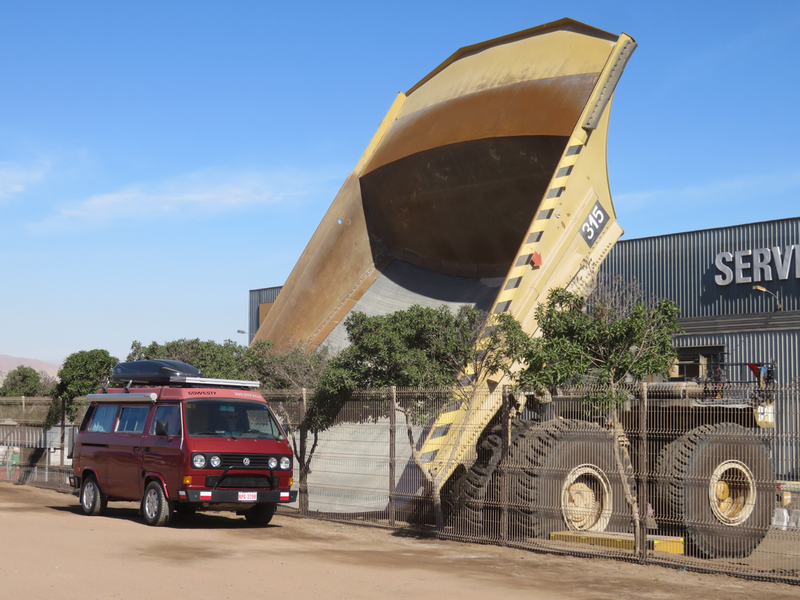 The city isn’t particularly exciting from a traveller’s perspective, but from an overlander’s perpective, it’s a great place to provision your vehicle. 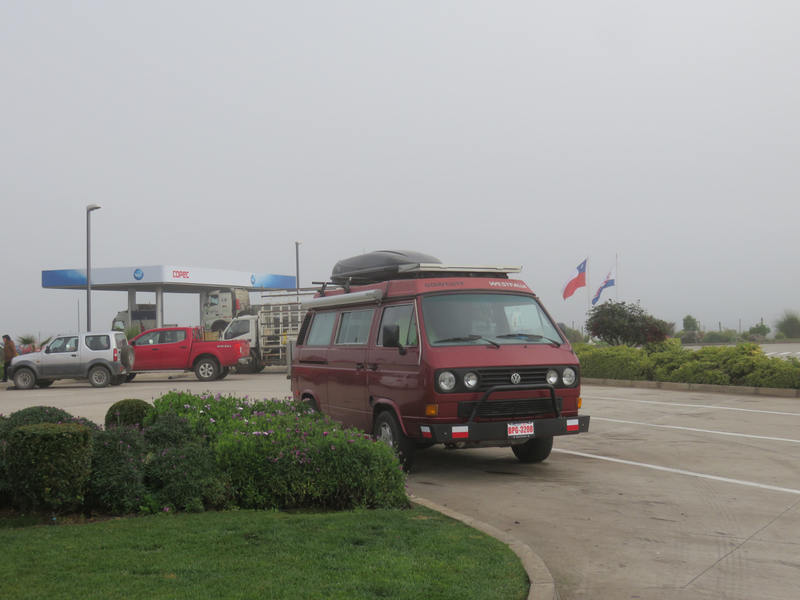 Gregor was particularly excited about having to access self-serve car washes (the first time since we left the United States), and being able to fill our on-board propane tank from a designated pump (just like at the Co-op stations in Canada). He wasn’t as excited about the price of gasoline, though – it was $1.60 CAD/litre. On our way to Antofagasta, we received a message from a Chilean who was following our Facebook page. He introduced himself as Camilo and he welcomed us into his country in perfect English. 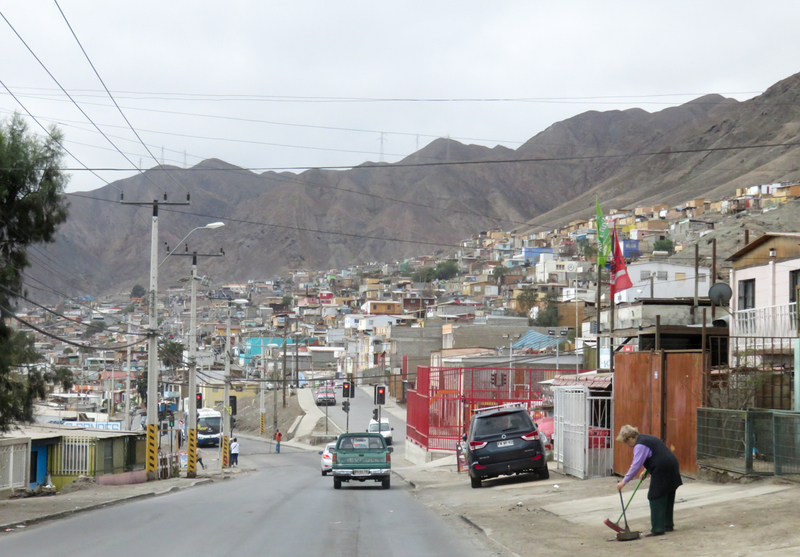 Camilo invited us to visit him at his home in Antofagasta. Having looked up his Facebook page, I found out that Camilo worked in the mining industry (which I’ve worked for in the past) and he was interested in overlanding. Based on these common points, we took a chance and accepted his invitation. 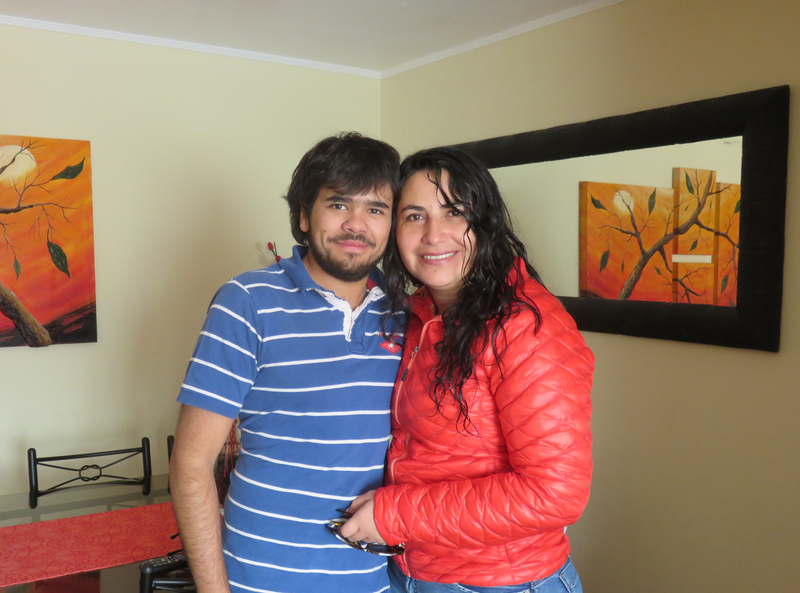 Camilo and Prisilla welcomed us to their condo and let us stay the night in their spare bedroom. We had a great evening together chatting about life in Chile, life in Canada, and traveling in South America. 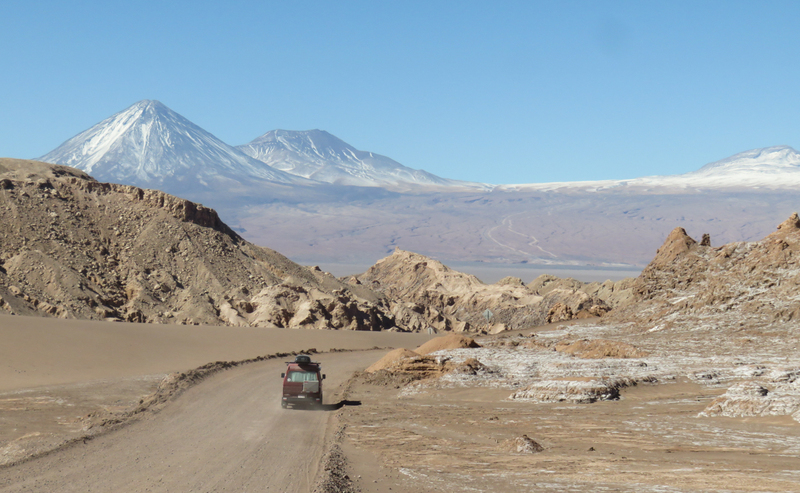 Camilo started an online forum called Chile Overland to help Chileans explore the world with their own vehicles. 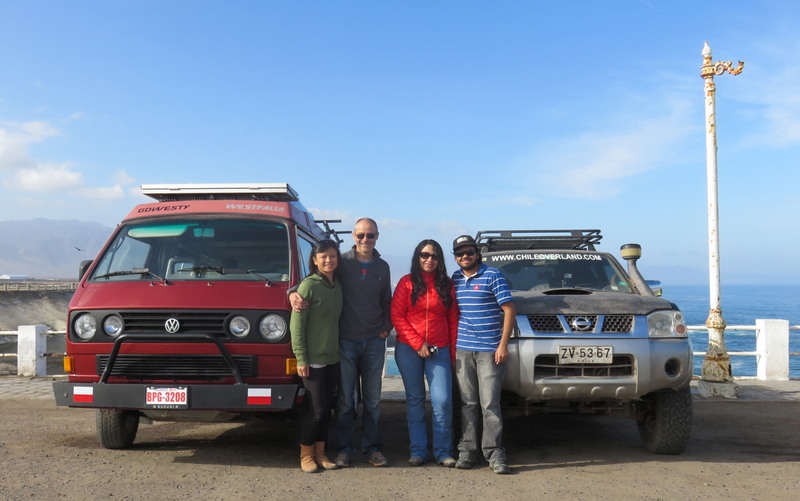 Over the years, Camilo has been tricking out his 4×4 Nissan truck for overlanding South America off the beaten track. 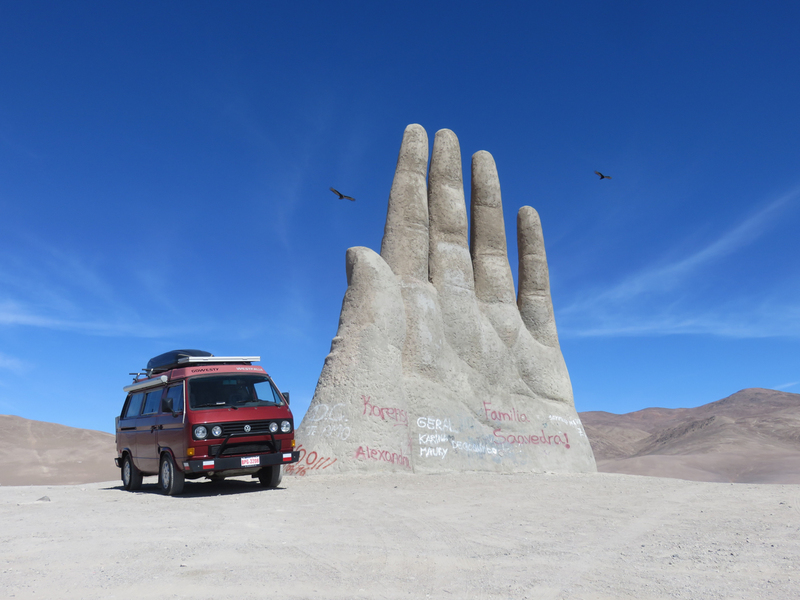 It was really neat to speak with a Latin American who is preparing for a big overlanding adventure – Camilo’s enthusiasm about discovering his home continent by car was infectious. 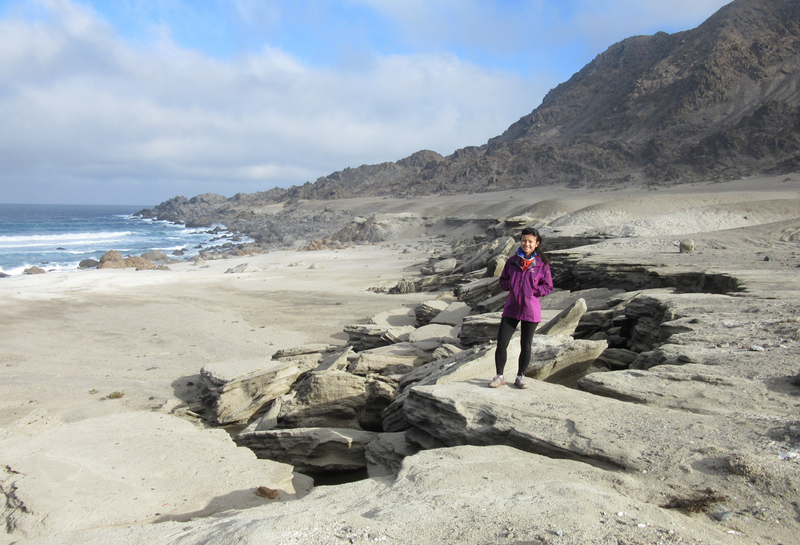 Originally from Santiago, Camilo moved to Antofagasta to work in the mining industry as an instrumentation specialist. When we told Camilo about how expensive we thought everything was in Chile, he said it was a result of the country’s strong copper industry. Chile produces a third of the world’s copper, and copper mining makes up 60% of exports and 20% of Chilean Gross Domestic Product. If you mix high-volume natural resource development with sound judicial and economic policies then, voilá, you have a prosperous nation. 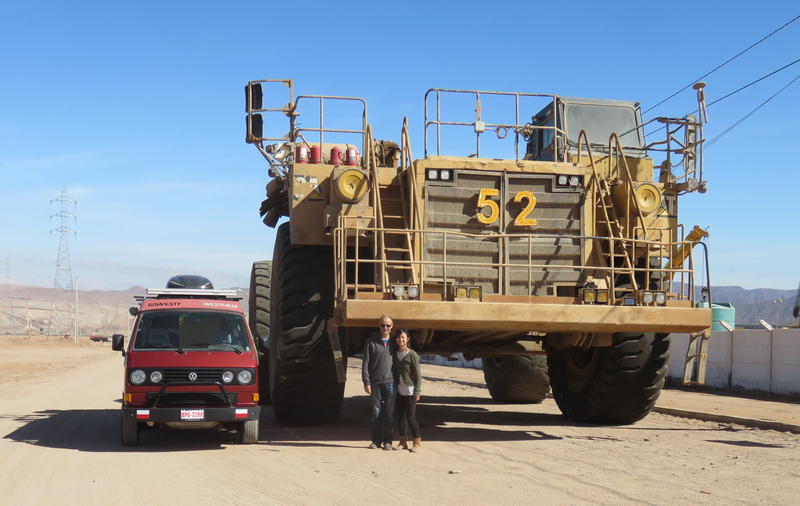 Camilo took us to a site where monster mining trucks were parked for maintenance. You can put 3 Luckys inside this truck! 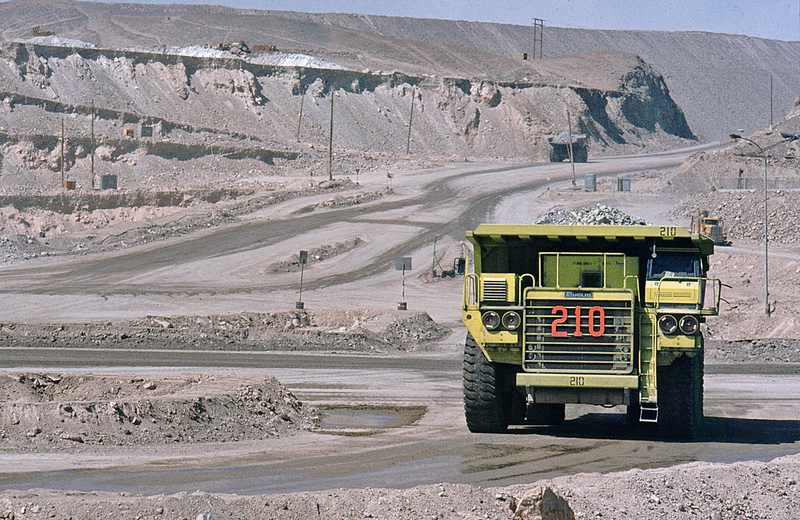 I remember watching an episode of a documentary TV series called MegaStructures, which showed a little lady driving one of these monster trucks in an open-pit copper mine. She got paid $100,000 USD per year to do her job. I didn’t understand why anyone would get paid so much to drive a truck, but Camilo explained that the job is actually quite dangerous. Hauling heavy loads through unstable terrain requires a lot of concentration and sound judgement, and injuries often occur in moments of distraction. Given Gregor’s driving record, I think he would make an excellent monster truck driver. 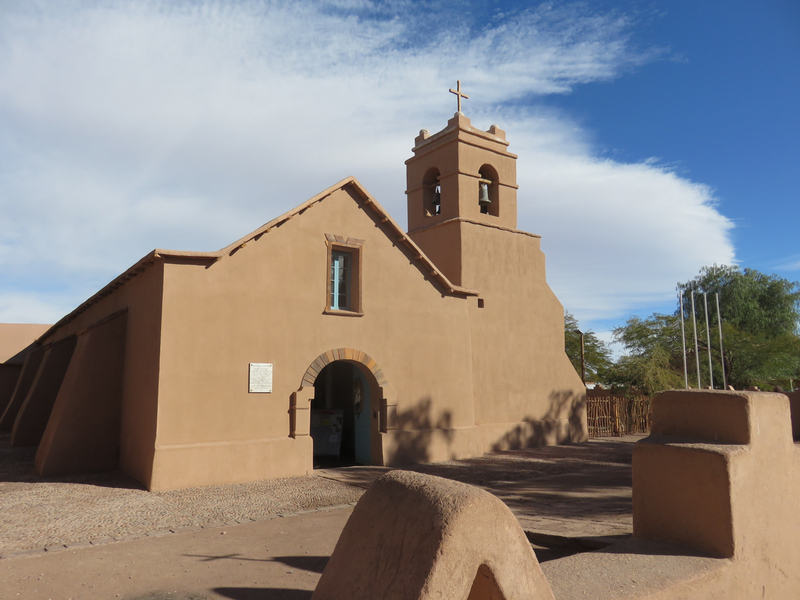 We said good-bye to Camilo and Prisilla and drove 75 km south to a site called Mano del Desierto (Hand of the Desert). 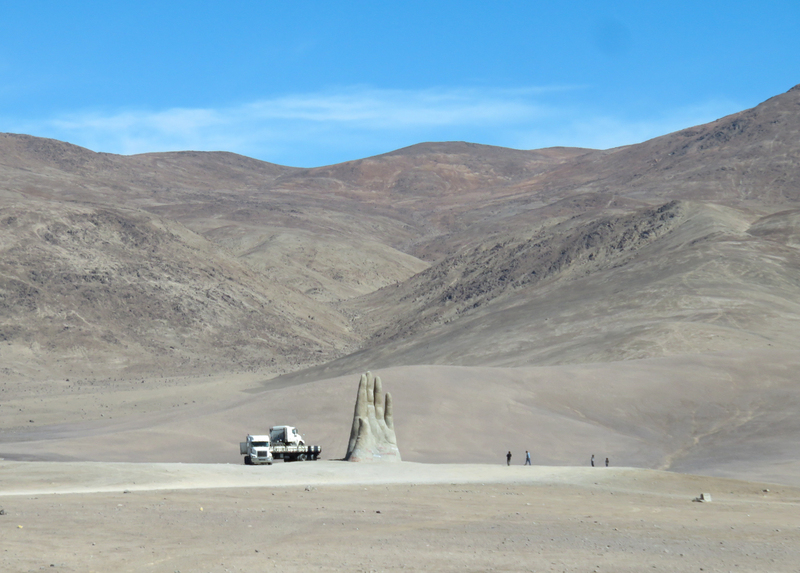 It’s a huge concrete sculpture of a giant hand emerging from the desert, created by Chilean sculptor Mario Irarrázabal. The Hand of the Desert represents human vulnerability and helplesness, expressing emotions like injustice, loneliness, sorrow, and torture. Vandals sometimes spray graffiti on the sculpture but it doesn’t take away from the sculptor’s message. 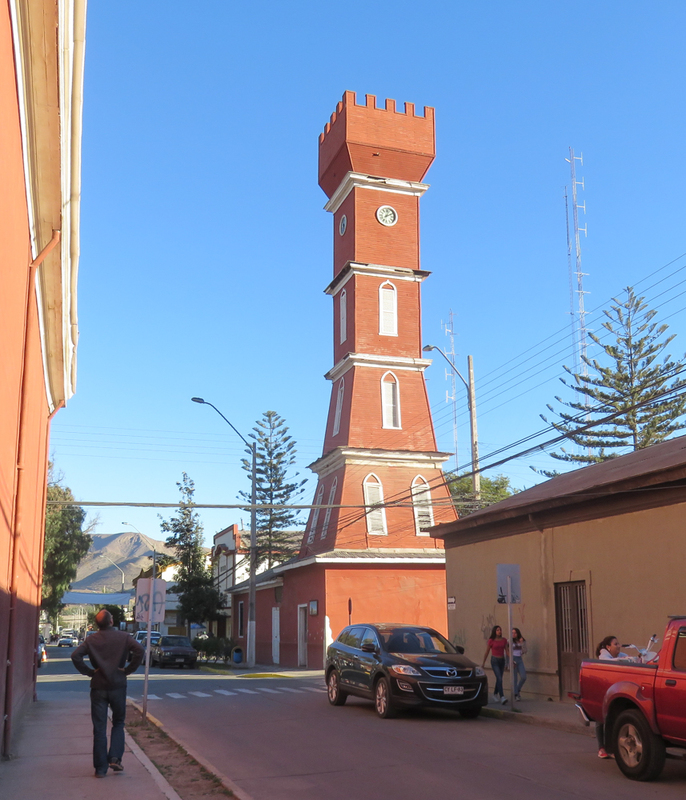 We continued southward to Chañaral, a small coastal town located near a national park that we wanted to visit called Pan de Azúcar (Sugar Loaf). 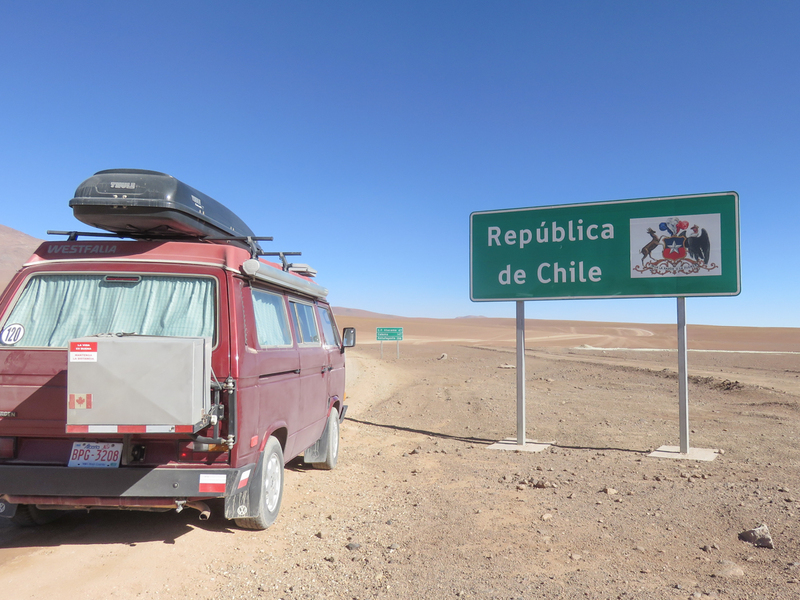 Since Chile was digging deep into our budget, we decided to save some money and spend the night at a gas station with pay-per-use bathrooms and showers. 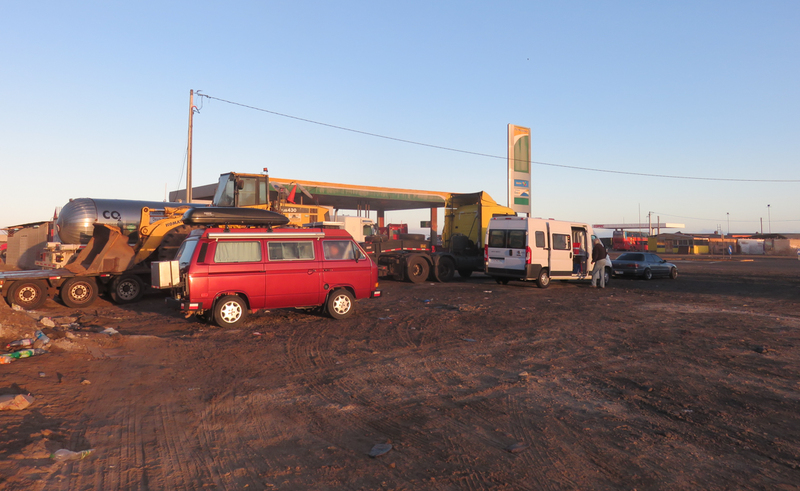 It was the first of many gas stations where we would end up sleeping in Chile. 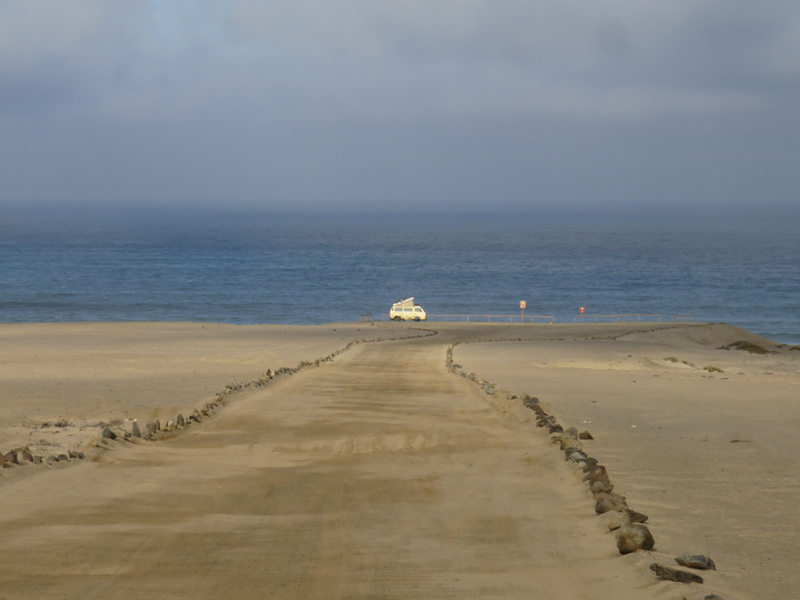 Pan de Azúcar is a desert park on the Pacific Coast that sustains some interesting flora and fauna thanks to a coastal mist that brushes the nearby mountain slopes. 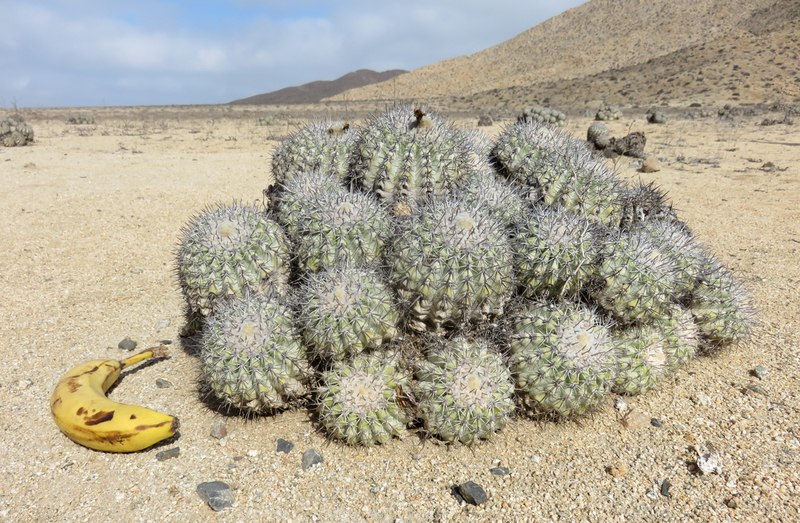 The park has more than 20 cactus species, the most unusual being the spiny balls called Copiapoa. While Gregor and I were driving through the park, we saw the unmistakable silhouette of a VW Westy in the distance. There must be a magnetic force that attracts Westies to each other because we immediately felt compelled to drive over and meet the owners. 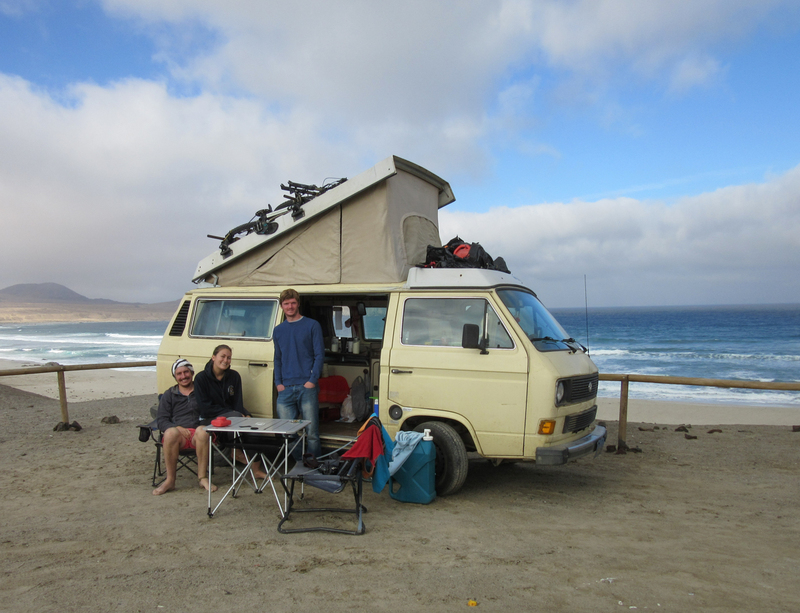 Peter and Meg are from Wales but they bought their VW van in California, where they started their Pan-American adventure. 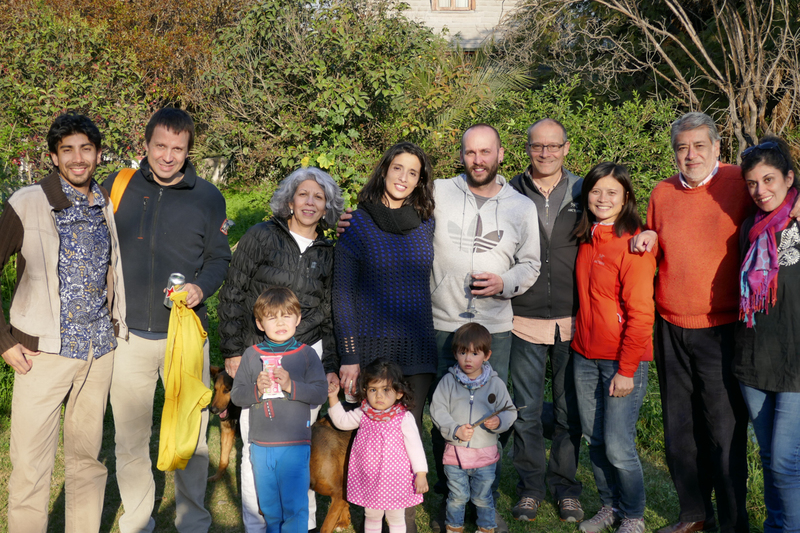 They picked up their friend, John, in Santiago only a week before so that they could tour northern Chile together during his two-week vacation. The three of them slept in the van and they spent most of their nights at wild camps (i.e., free, with no facilities). When we met them, Peter and Meg had just finished bathing in the frigid sea water. One of the many things that I’ve learned on this journey is that different people travel in different ways, even among different Westy owners. Having an extra guest in the van or bathing in cold salt water may be uncomfortable for us, but it was totally fine for them. Even though we only chatted briefly, Peter and Meg offered us a place to stay in Wales if we ever visit the UK again. Gotta love the Westy community. 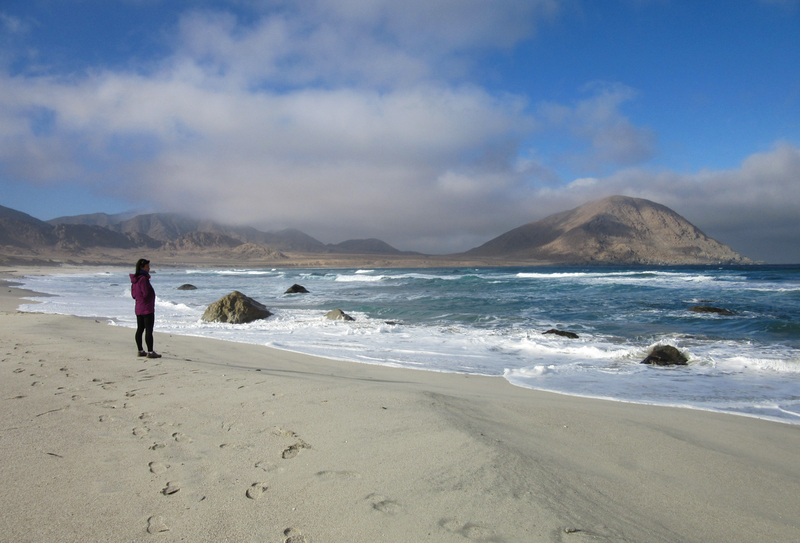 One of the things that Gregor and I wanted to do in northern Chile was do an astronomy tour at an observatory. 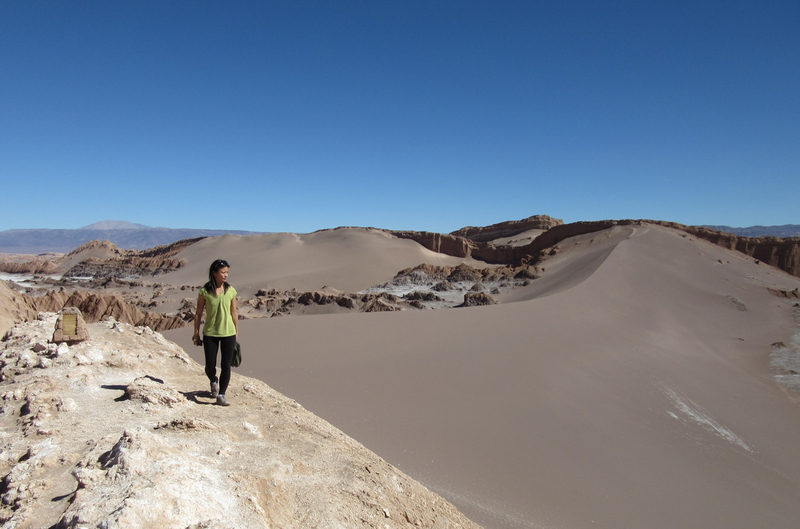 The area around the town of Vicuña has at least 300 clear days and nights, which is perfect for star gazing. 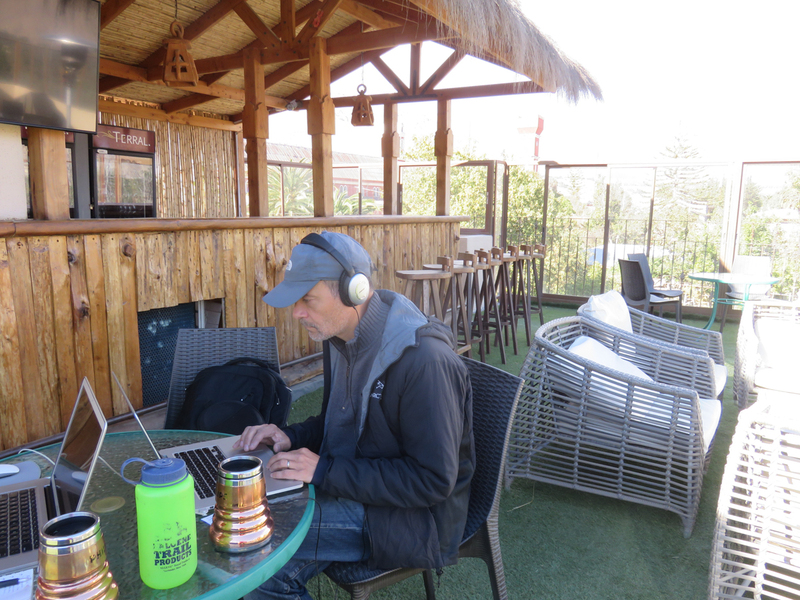 There was also a hotel in Vicuña that allowed overlanders to camp in the parking lot and use the wifi, which was perfect for Gregor’s work days. 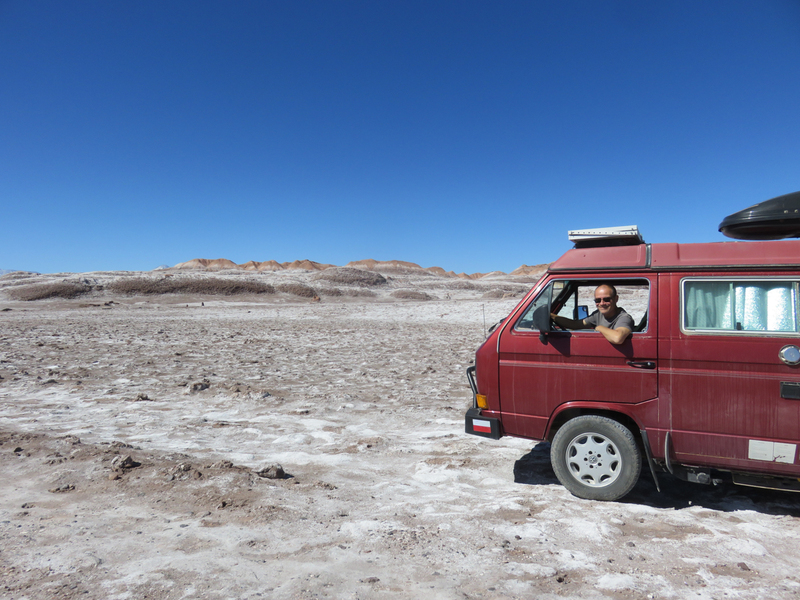 So we drove to Vicuña to get some Internet and see some stars. 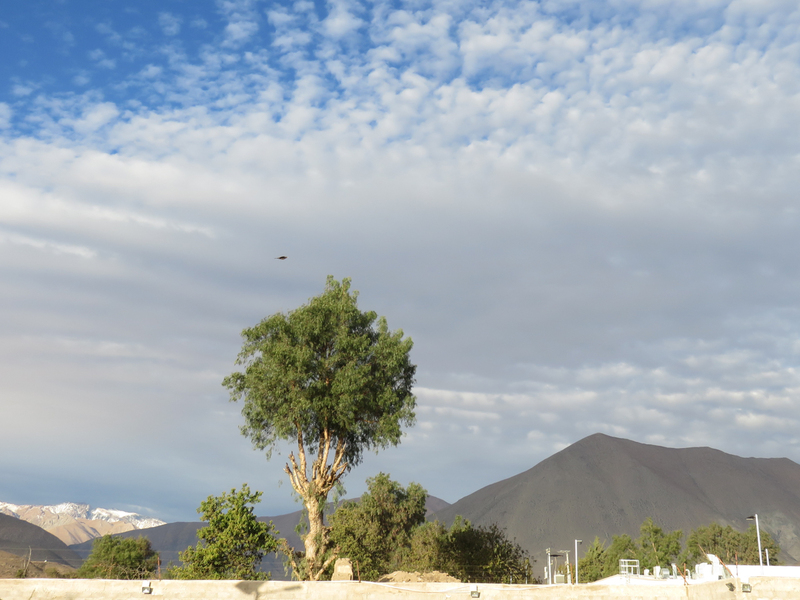 After Gregor’s work days, we sat in Vicuña for several more days waiting patiently for the clouds to part. The observatories don’t run tours when it’s cloudy, which is a good thing. However, the longer we waited, the fuller the moon became. 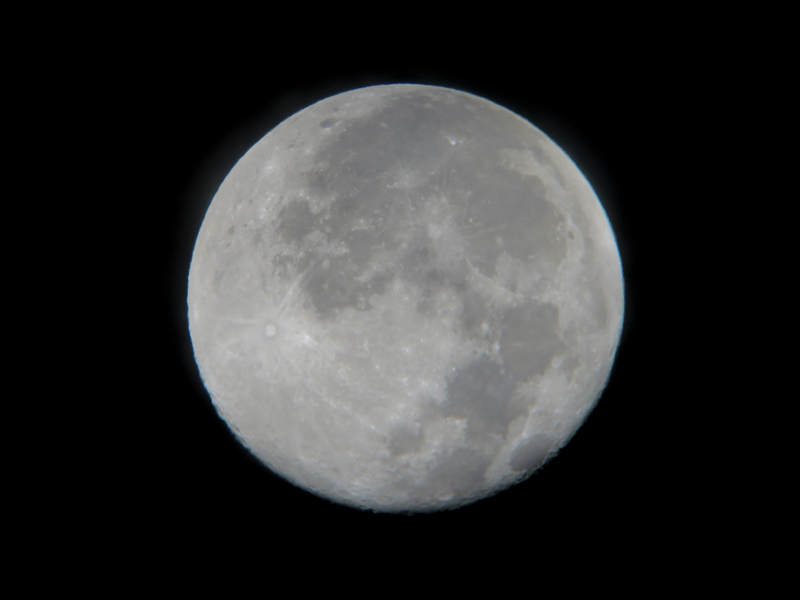 This meant that the moonlight would obscure the night sky and we wouldn’t see as many stars. Once the sky was clear, we jumped on the opportunity and took the 11 pm astronomy tour at Observatorio Cerro Mamalluca. Gregor and I were super impressed with the tour. We were the only ones among the hundred or so visitors who spoke English, so we had a private tour with the English-speaking guide, Juan. He was enthusiastic, knowledgable, and very personable. He was also well travelled and he spoke about the constellations of the northern and southern hemispheres in a very intimate and interesting way. Since it was just the two of us, we could take our time looking through the telescopes and asking many geeky questions. The light of the full moon didn’t dampen our experience. In fact, it was the highlight of our evening. 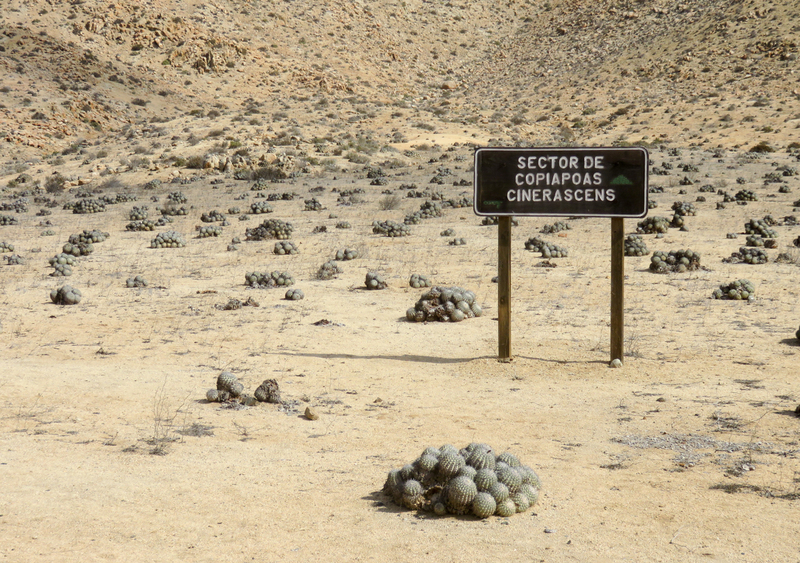 Vicuña is a major production centre for pisco, the high-proof sprit that is made from distilled grape wine. 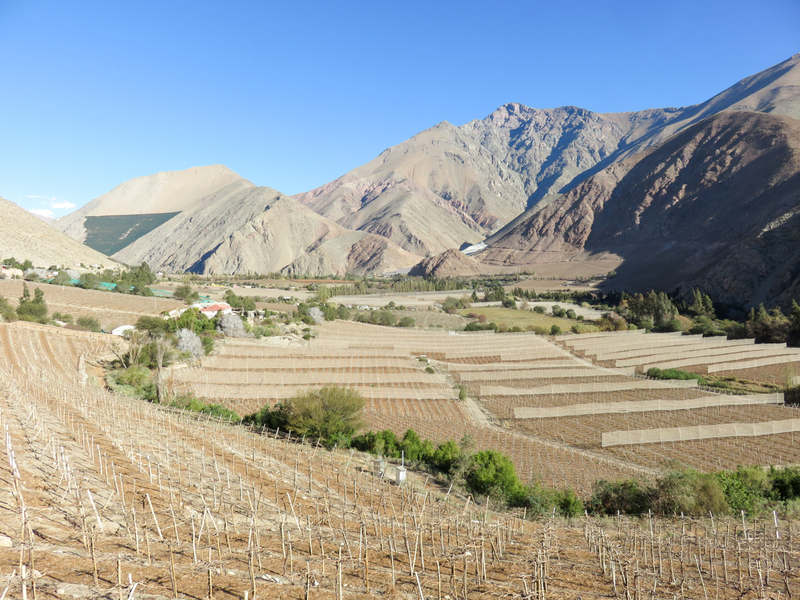 There is much debate about whether pisco originated in Peru or Chile, but there is no arguing the fact that Chileans are very proud of their pisco. 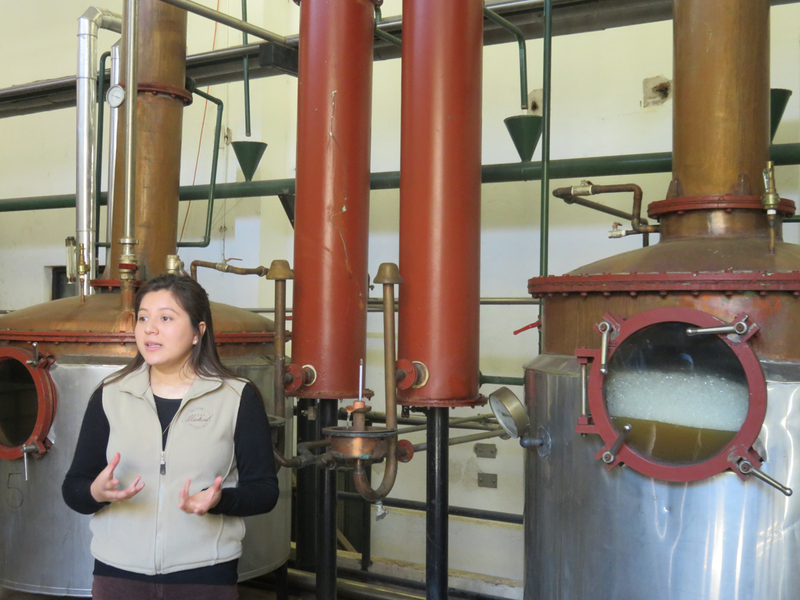 Even though we’re not really pisco drinkers, we were curious about how it was made. 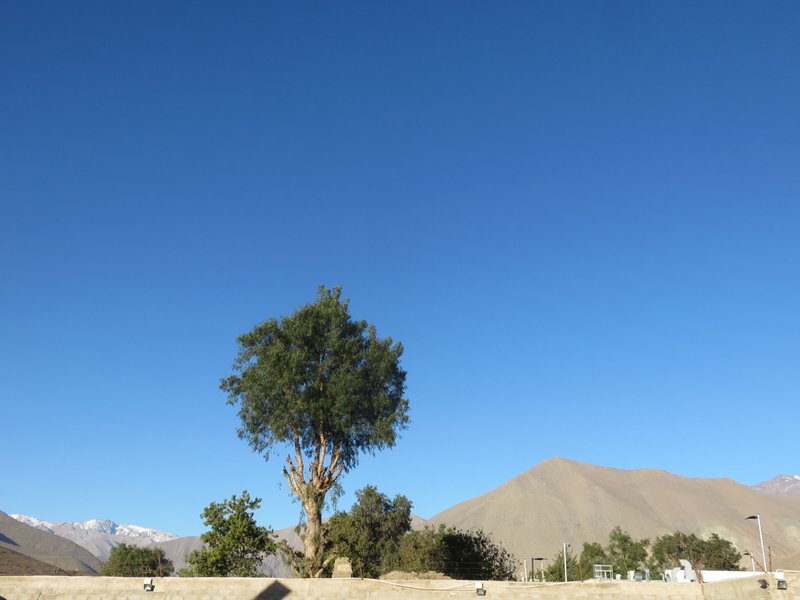 So we drove to the Elqui Valley for a tour of the Pisco Mistral Distillery. 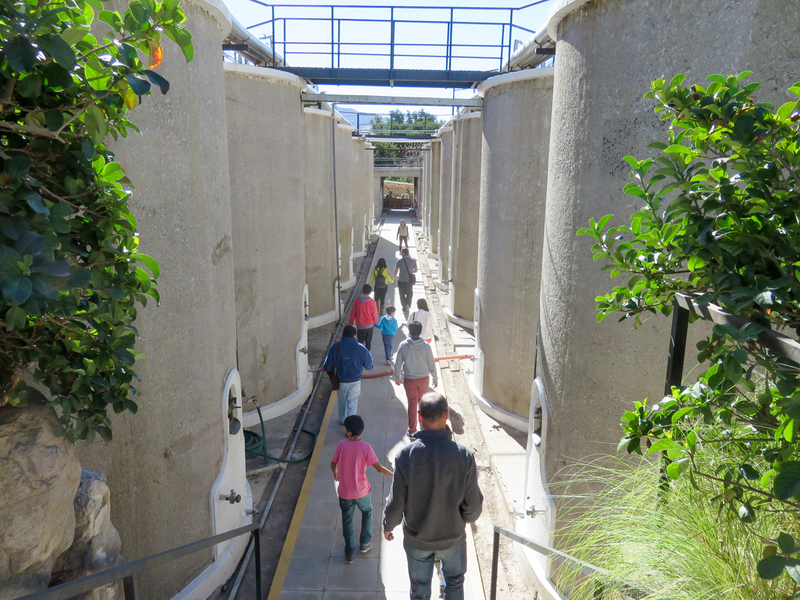 Similar to wine grapes, the grapes destined for pisco are fermented in large vats. 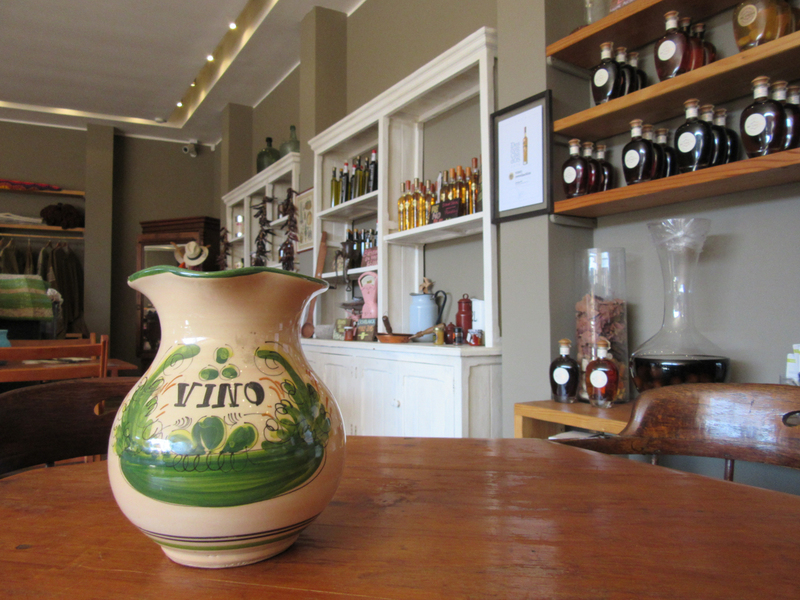 The fermented grapes are then distilled. The distilled spirit ages in barrels. 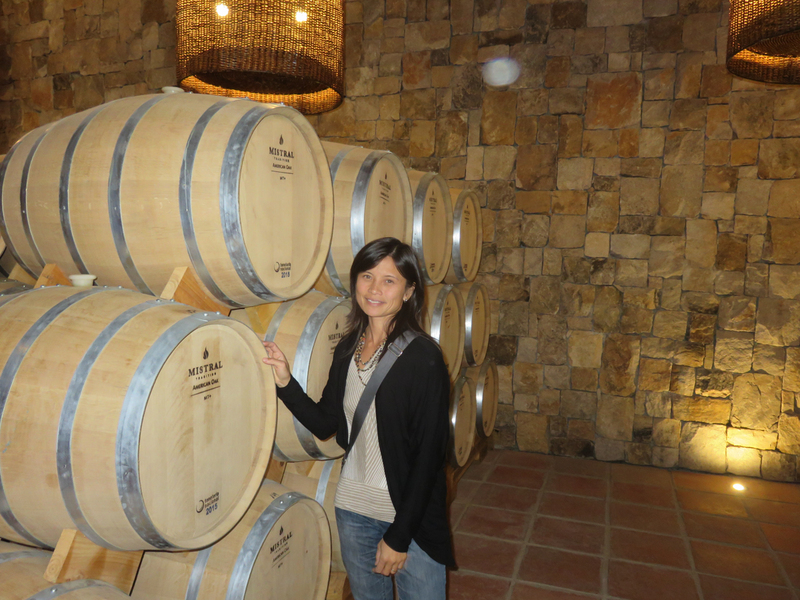 After several months or years in the barrel, the pisco is ready for tasting. Like I said, we’re not really pisco drinkers. 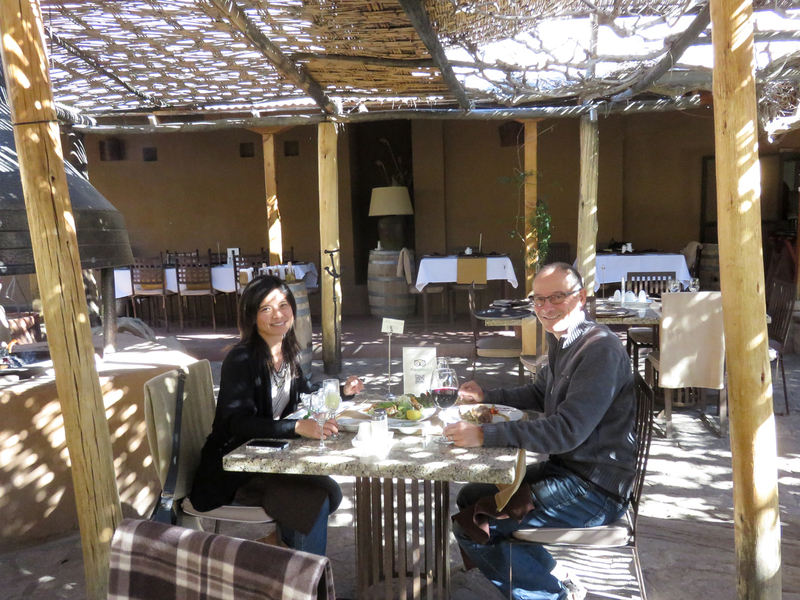 Lunch at the Pisco Mistral Distillery Restaurant. 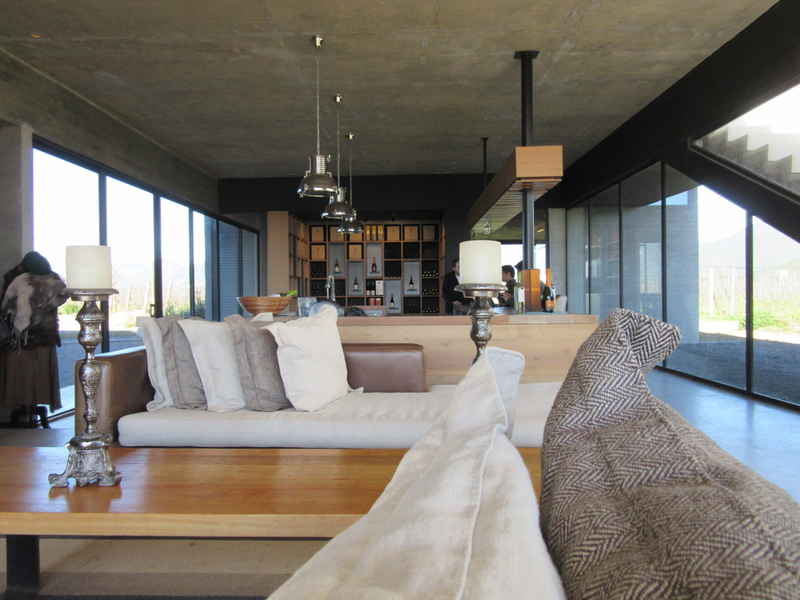 The dappled sunlight made us feel like we were high-class…even though there was big hole in the roof. 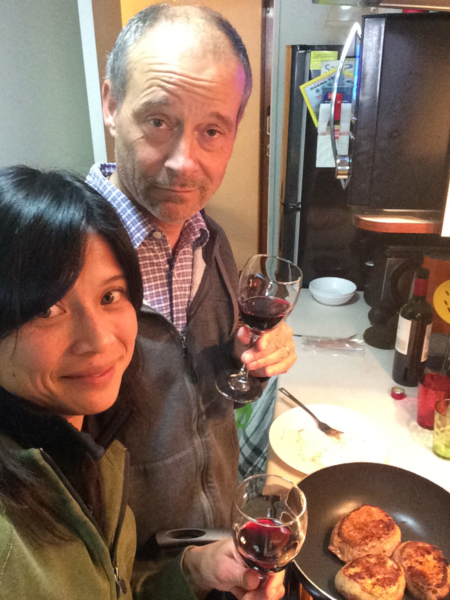 We decided to go all out in Santiago and rented an AirBnB apartment for one week. We were scheduled to fly from Santiago to Winnipeg, Canada, to attend the weddings of my sister, Nikki, and Gregor’s niece, Kira. 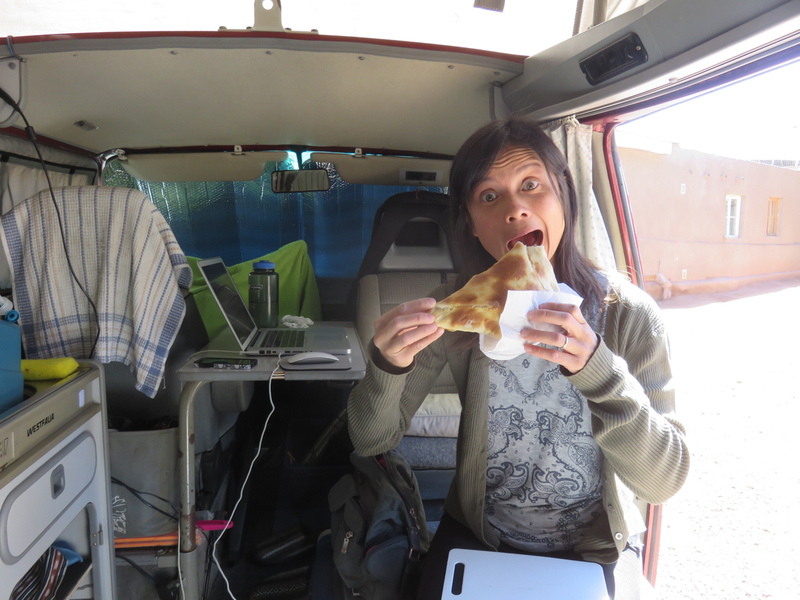 There aren’t any formal campgrounds near Santiago and we wanted some space to prep for our month-long trip, so the apartment was a nice solution (and a nice treat!). 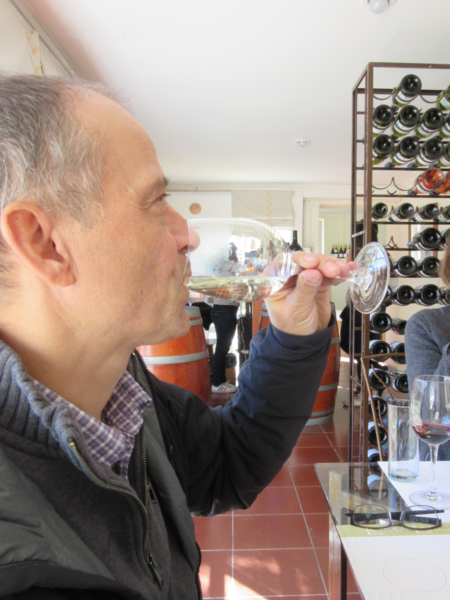 We wanted to bring back some boutique Chilean wine as gifts for our friends and family, so we splurged on an organized wine tour in the Casablanca Valley (one of 14 wine growing valleys in central Chile). 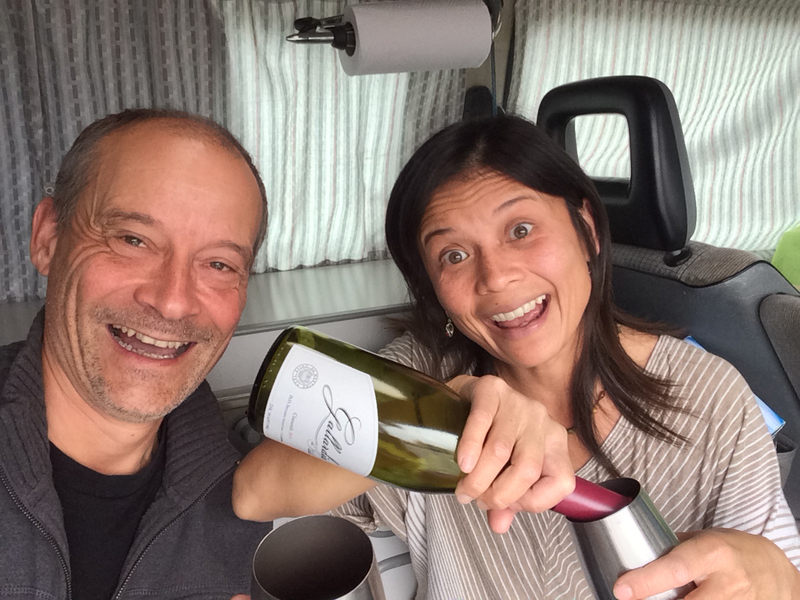 Uncorked Wine Tours provided an excellent full-day wine tasting experience. 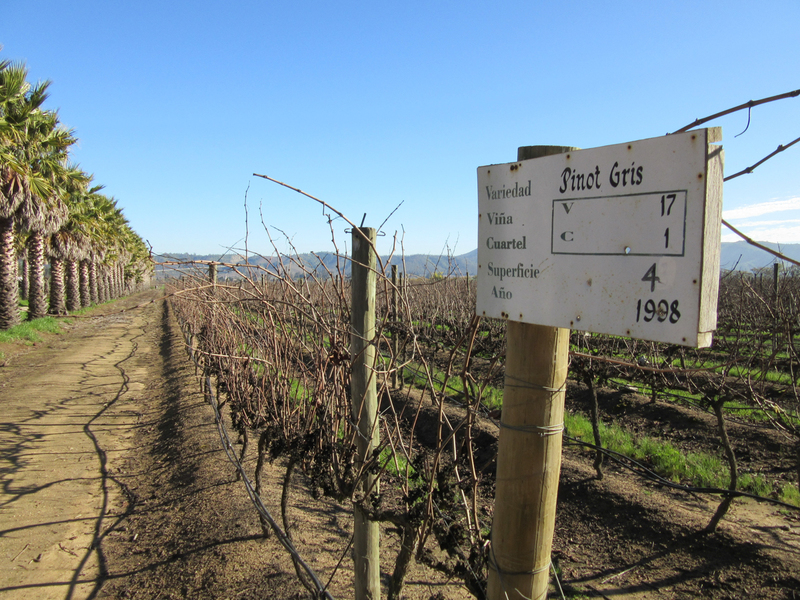 The company picked us up at our apartment in a comfortable tour van and took us to three boutique wineries: Bodegas RE, Loma Larga Vineyards, and Quintay. 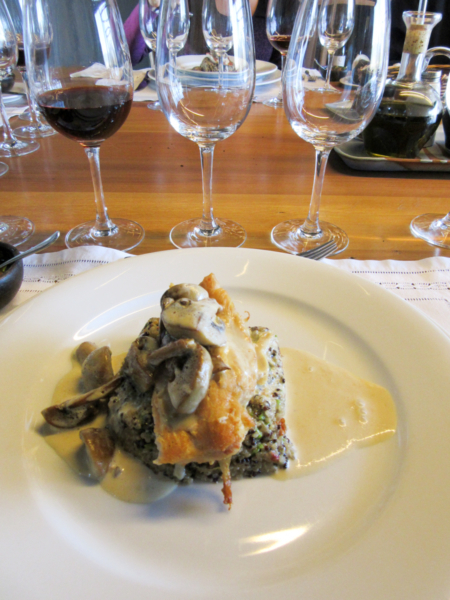 The day included a tour at each vineyard, generous wine tastings, and a gourmet lunch. We absolutely loved the tour. 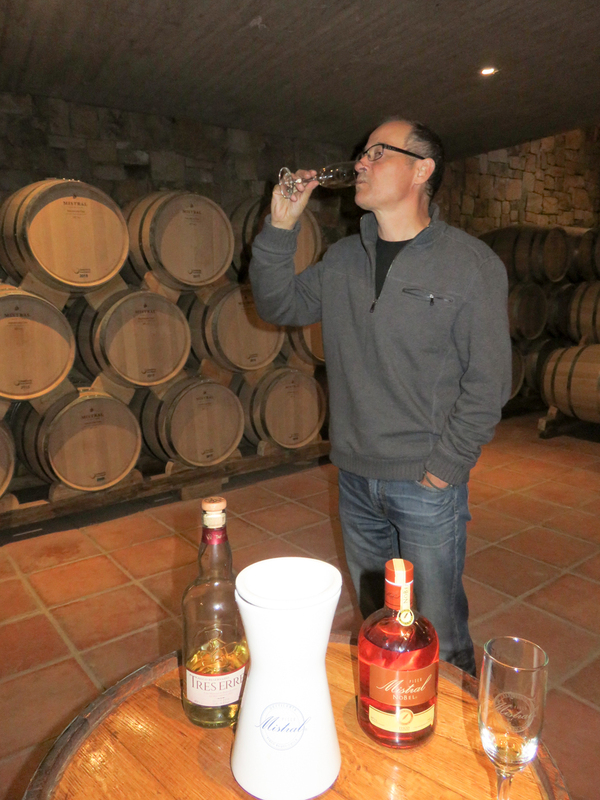 Our guide, Jose, was the co-owner of Uncorked and a former agricultural researcher. 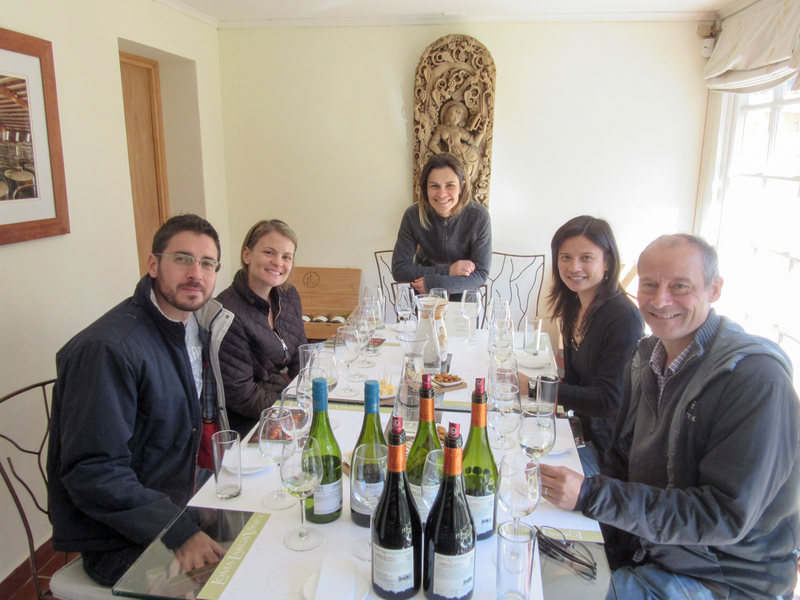 On the drive between wineries, Jose educated us on a wide range of viticultural topics, like the difference between wine varieties, the wine-growing process, and the history and economics of Chilean wine. Fun fact: Chile exports 80% of the wine it produces. 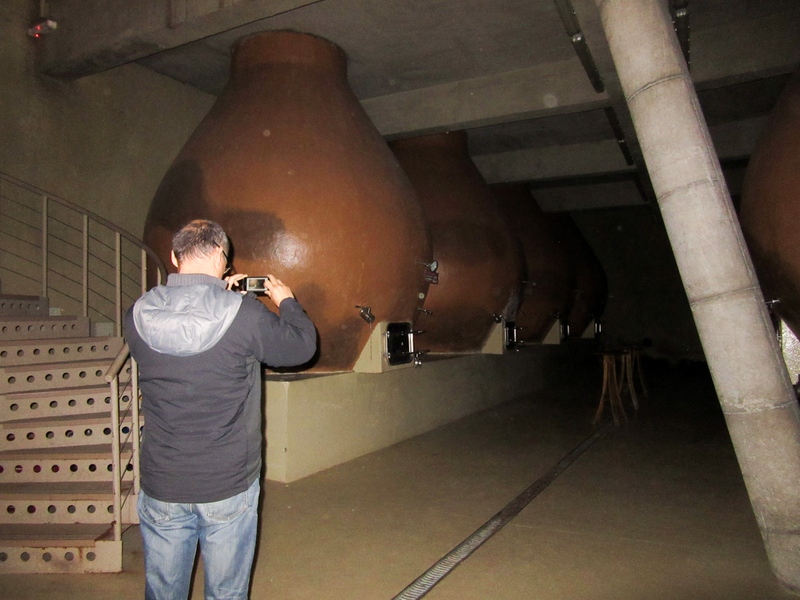 The fermentation vats at Bodegas RE were shaped like the clay fermentation urns used by the wine-makers of ancient Rome. We were nervous about leaving Lucky in the big metropolis of Santiago for a whole month while we went back to Canada. 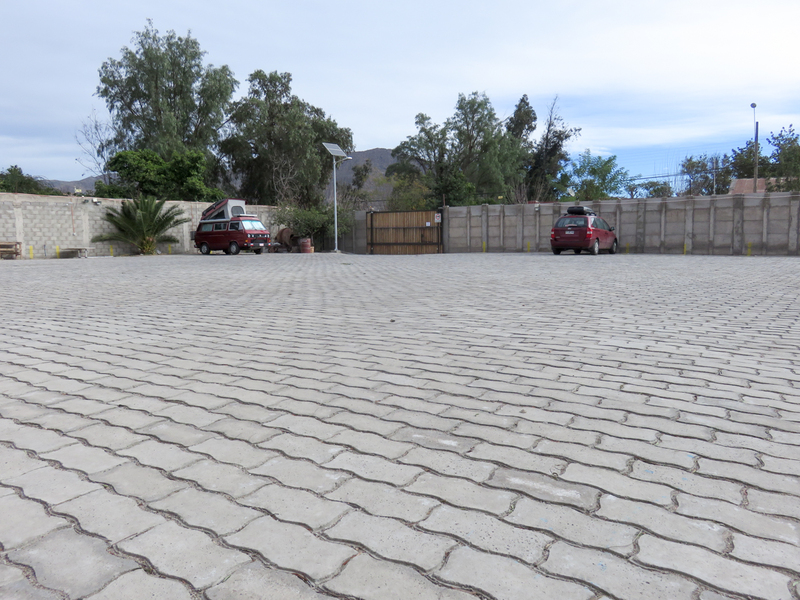 During our travels, we actually met three different Chileans (all strangers) who offered to connect us with their family members in Santiago so that we could safely park our van. Although we were grateful for their generosity, we still felt uneasy about leaving Lucky with strangers. So I contacted our good friend Rafael, the man who introduced me to rock climbing – and, ultimately, to Gregor. Rafael grew up in Santiago and emigrated to Winnipeg as a teenager. He had a VW bus back in the day, so when I told him about our situation, Rafael immediately connected me with his sister, Soledad. Soledad greeted us like we were family and welcomed us into her clan. 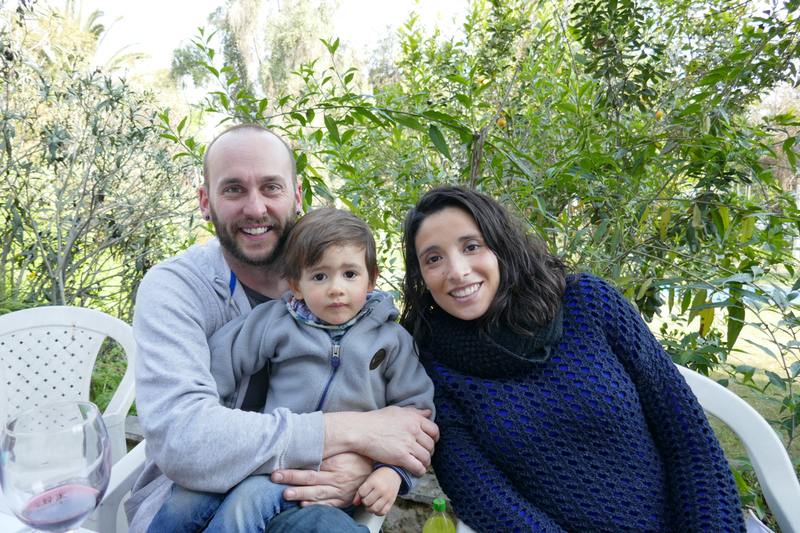 Soledad’s son-in-law, Damon, is originally from Winnipeg and runs an English school in Santiago called Empower Language Consultants. Damon was a great help to us, organizing Lucky’s storage and checking on her each week while we were away. On our way to the Santiago airport, Damon and Paz took us for lunch and introduced us to the classic Chilean sandwich: the Lomito. 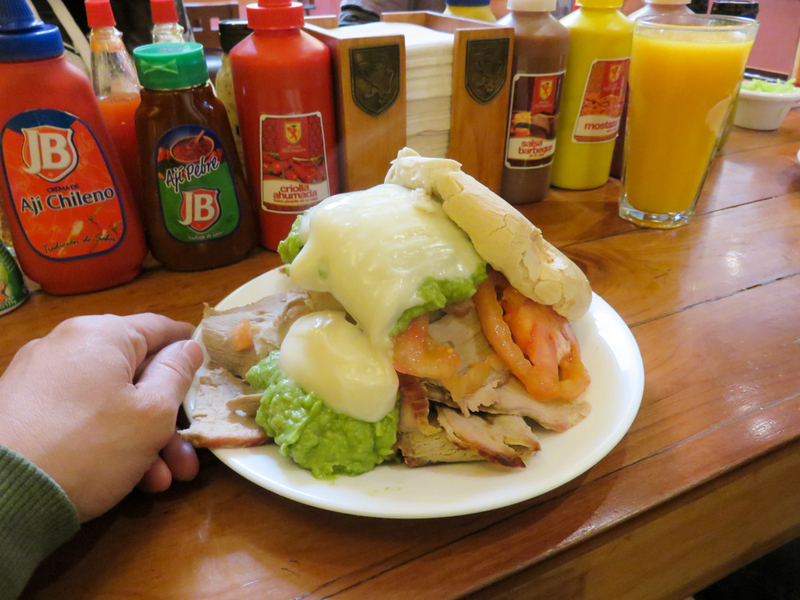 It’s a pork loin sandwich with tomato and avocado, and it’s typically served in Bavarian-style restaurants called “soda fountains” (fuentes). The sandwich was ridiculously huge. 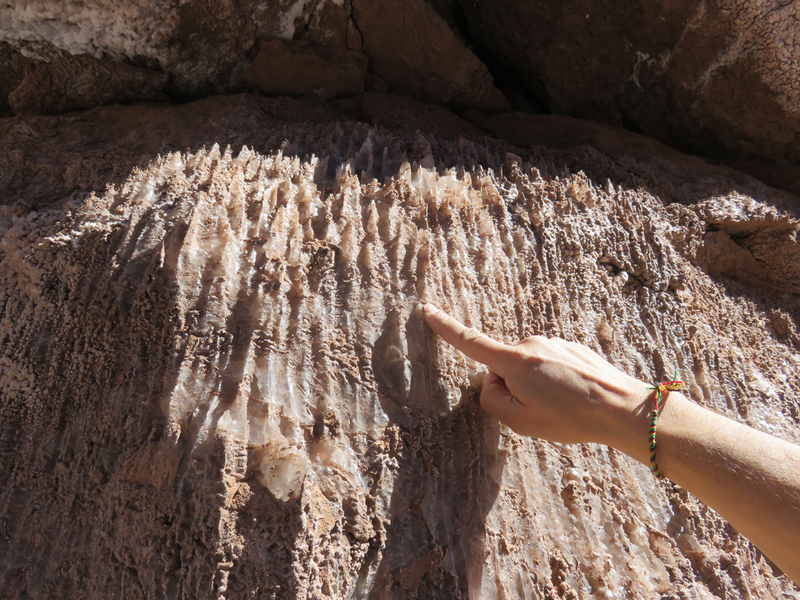 If there’s anything we observed about Chile, it’s that things don’t come tiny. The Jumbo supermarket, the monster mining trucks and the huge memorials, the giant Hand of the Desert and the mega-sized sandwiches…this prosperous nation does it real big. 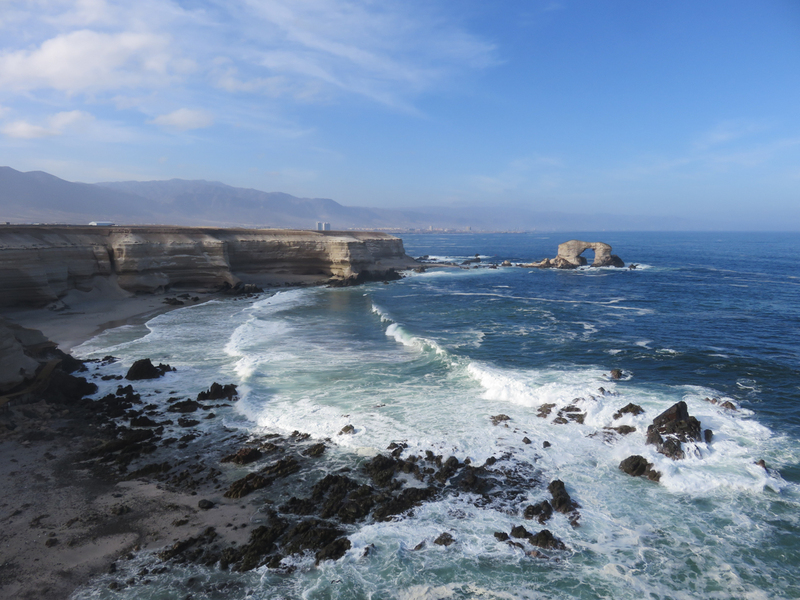 The country is also blessed with big-time nature: huge Andes mountains in the east, long Pacific coastline to the west, expansive Atacama Desert in the north, and high-producing valleys in the central regions. 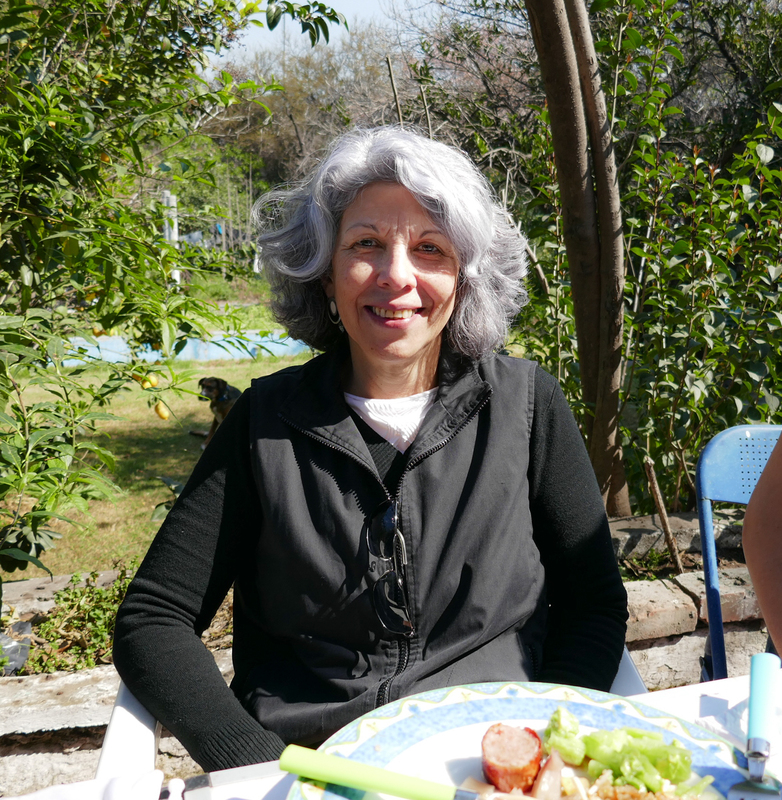 Our impression of Chileans is that they are really down-to-earth, light-hearted, and genuinely helpful people. Thanks to them, we had the opportunity to go big AND go home. Nice tie-in at the end, Janice: “Go big AND go home.” Your narrative writing style is such a treat to read. I loved the thread of serendipitous connections that runs through this post in particular. It’s clear that this was one of the most enriching things about your tour of this region – stunning scenery notwithstanding! Hi Ted, thanks for the nice comment! You’re right, the chance meetings and connections we make on the road turn the “drive” into more of an “experience”. Looks amazing but I think those gas prices, our V8 and long drives are going to murder our budget! :/ We’d hoped to blow all our money on Wine! Lovely. 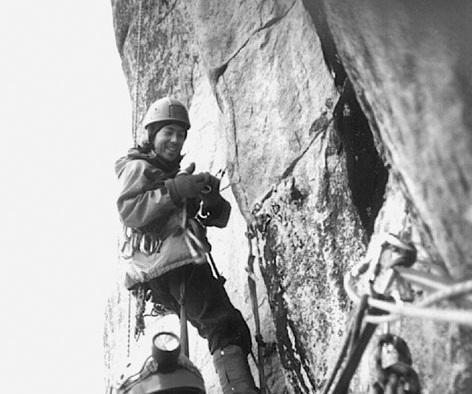 Glad you were able to use that old photo of Raphael (winter aid-climbing at Cave Cliff, Gooseneck Rocks, Ontario about 20 years ago…). It’s a great shot! Thanks again for sharing it. It was really neat to see the similarities between him and members of his family. Beautiful! I love to see my own country through foreign eyes… you know how I look my wonderful country. Thanks for let us be part of your big journey, I really appreciate it. Beautiful pictures , keep them coming. I used to fix the huge mining trucks when I was 18 thru 20 at a copper , lead, zinc mine in northern Ontario. The pictures brought back many memories , almost 40 year’s ago. That’s so neat because I got really nostalgic seeing the mining equipment. Reminded me of good times in northern Manitoba. I love seeing your faces here! Miss you guys. 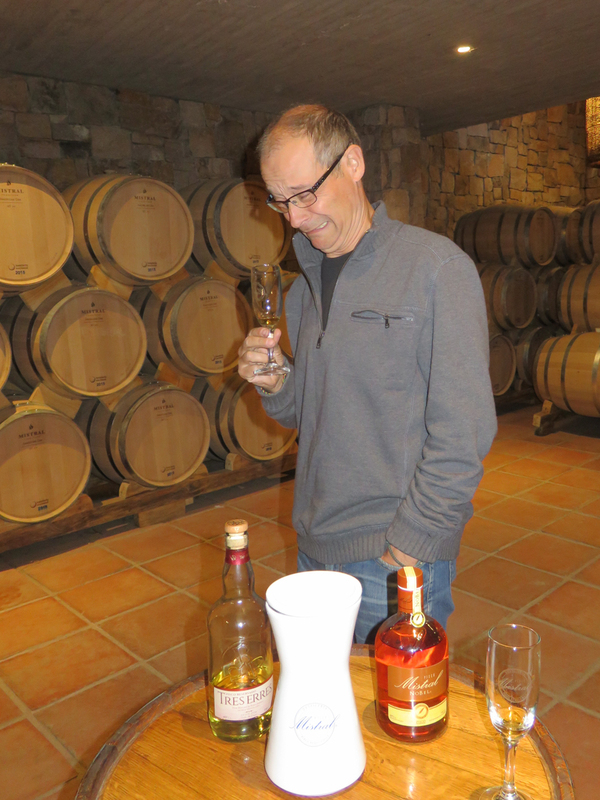 The photo of you eating at Pisco Mistral Distillery Restaurant reminds me of our pre-sailing lunch together at the cidery in BC. Good times! Yes, the wine region here made me think of the good times in BC with you, Ted, and the cheese club gang. We wish we could transport you to some of these places! Fantastic! Thanks, George 🙂 We’re in Puerto Natales now and plan to be in your neck of the woods in late Jan/early Feb, so will definitely look you up!